Year 5 student Jake McDaniels was able to experience what it is like to be a co-principal at YCIS Regency Park Campus on May 25th. This day was set up as a charity initiative for Heart to Heart and part of the live auction at the Spring Charity Brunch. 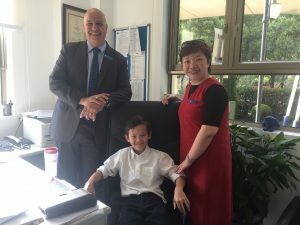 Jake started his day by meeting his fellow Co-Principals for a briefing in the school office to go over his duties for the day. There, he was given all the things that a Co-Principal needs to get through the day: a YCIS water bottle, pens, pencil case, journal, stationary set and bookmark. Now that he was equipped with all the necessary tools, Jake was off to start his day. The morning was not over yet! 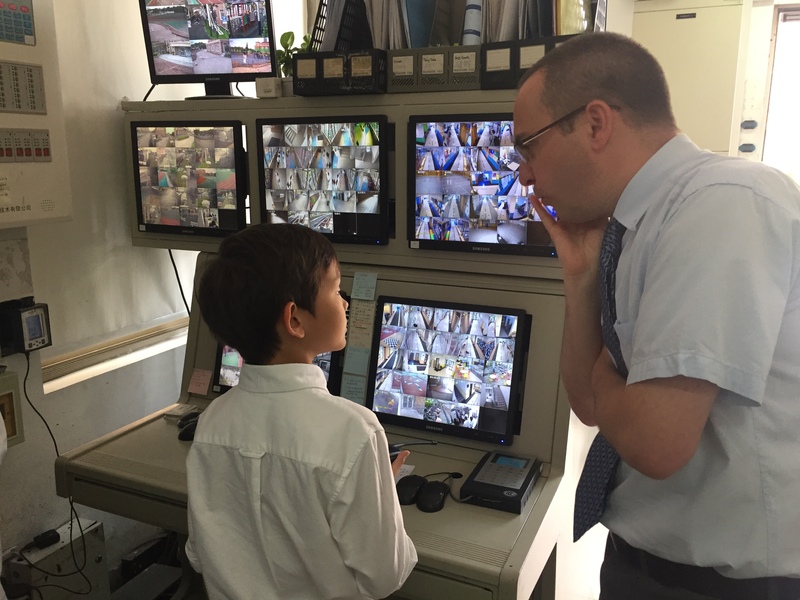 Mr. McEnhill and Jake went to do a classroom observation in Year 4B. 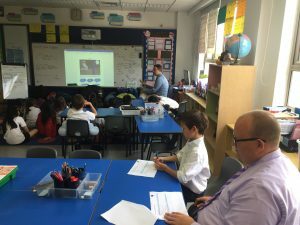 Jake assisted Mr. McEnhill while he observed students making sure they were engaged and knew the learning objective and success criteria for the lesson. “Mr. Kravalis did a really good job,” was Jake’s feedback after the observation. 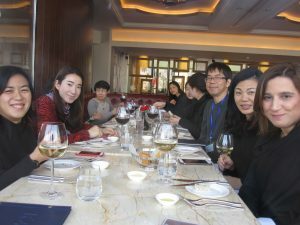 Finally it was lunchtime! 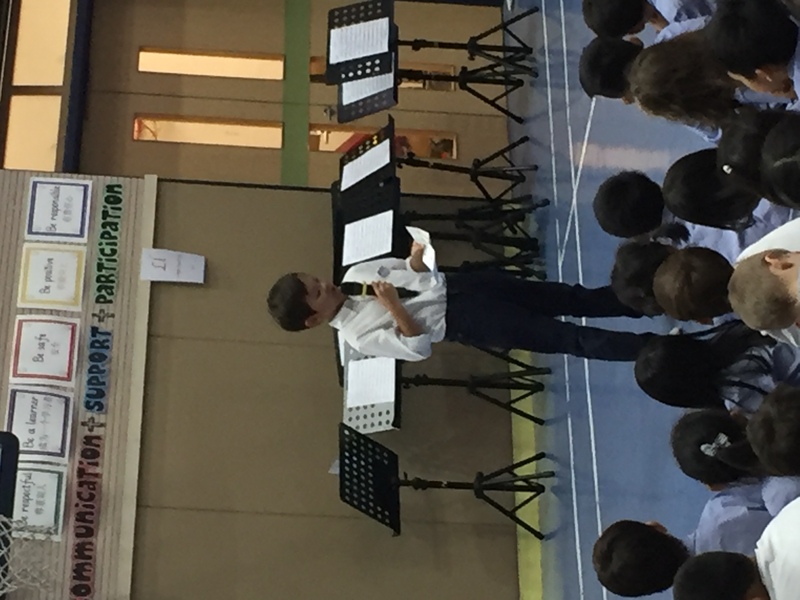 After lunch and another recess duty, Jake helped to lead the Whole Primary Assembly. 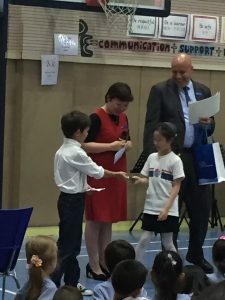 This included introductions, presentation of the Global Child Award and Jake even received an award himself for his efforts. 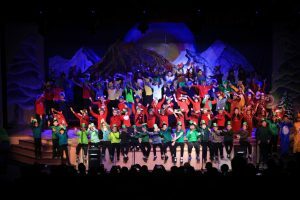 “I felt happy and proud giving the awards out and knowing who the students were,” said Jake. 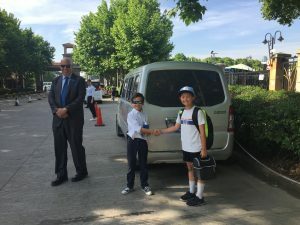 Finally Jake’s Co-Principal job was over. He had a busy but fun day. “I think being a Co-Principal is hard. You have to run back and forth doing different jobs. I think its also a lot of fun, I had fun today.” Thank you Mr. McDaniels for the fine job you did being Co-Principal for the day. We had a special addition to the YCIS Primary Leadership Team last week, our student Co-Principal for a Day, Jake McDaniel. 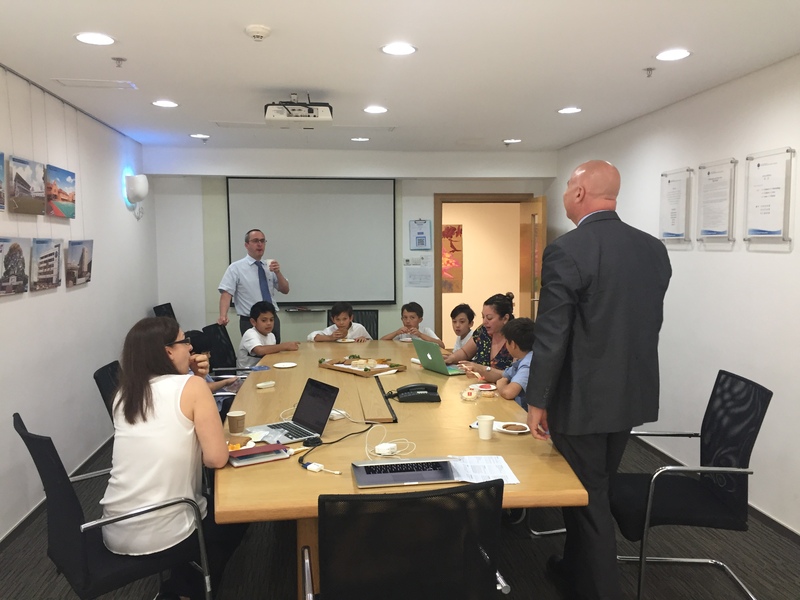 We took this opportunity to have a talk with our Co-Principals, Mary Yu & Damien Hehir and ask them a few questions. 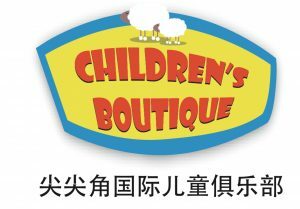 Where are you both from, and how long have you been in Shanghai? Damien: I am from Adelaide, Australia and have been here for nearly 17 years. 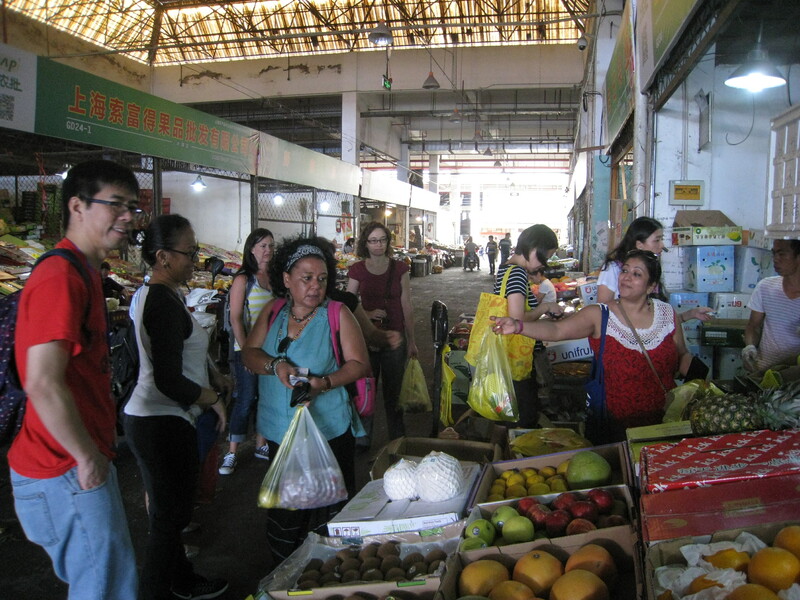 What is your favourite thing to do with your family in Shanghai? 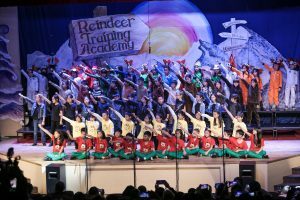 Damien: We had a season pass for Disney this year and we enjoyed going there a lot. We like to go eat out as a family and we especially enjoy taking our dog, Roger, for a walk. Name ONE thing that you look forward to, coming to school each day. 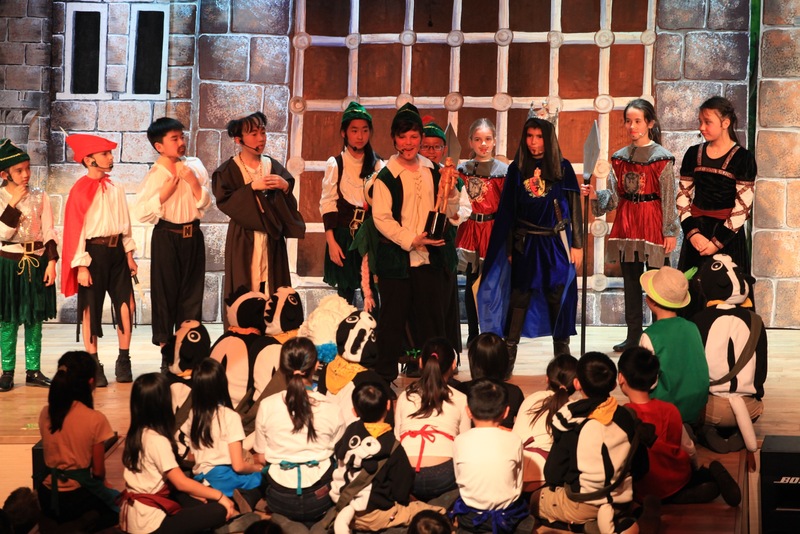 Damien: I just love coming to a place where the children are happy and learning, in a safe and nurturing environment. I also greatly enjoy leading a team of wonderful people who really want to make a difference in children’s lives. 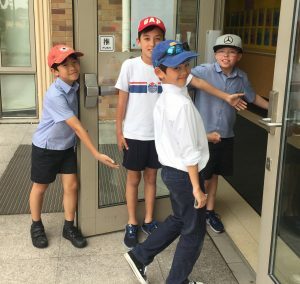 Mary: I like starting the day off with Gate Duty, because it gives me the opportunity to greet everyone and it’s always great to see so many happy and eager faces in the morning! What is the most difficult thing you have to do as Principal? Damien: When I have to meet with parents about an issue and both parties believe that they are doing the right thing and both have the child’s best interest at heart but can’t reach agreement. It can be difficult to reach consensus but always the child must come first. Mary: I am a parent at heart, but in school I’m also a leader. Sometimes those two don’t quite fit together and you can have different perspectives and you have to choose to be professional, even though the parent inside me has different emotions. 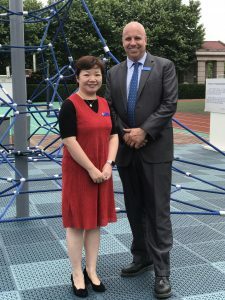 When did you know, you wanted to be a Principal of a school? And how long have you been Principal? Damien: I never imagined that actually, you kind of imagine yourself one step up at a time. For me it was a natural progression, positions just presented themselves at the right time. 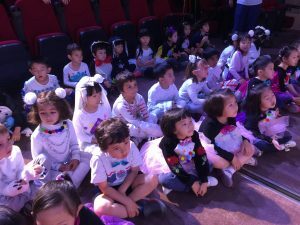 I came to Shanghai in 2001 and was a Class teacher in Gubei for 5 years. 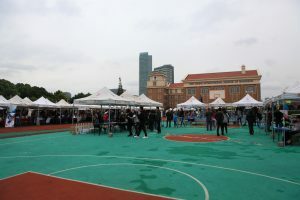 In 2006 I came over here to the Pudong Campus and was a Coordinator for 2 years. I took over as Vice Principal in 2008 and am now in my 5th year as Co-Principal. Mary: I also went the “classic” route – I started here at YCIS in 2000 as a Chinese teacher and then became Chinese Group Leader. 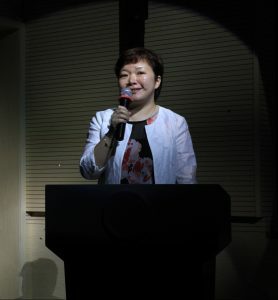 I moved up to become Chinese Coordinator and from 2008-2010 I was Vice Principal. At this point I thought I would be Vice Principal for quite some time, but life had a different plan for me. 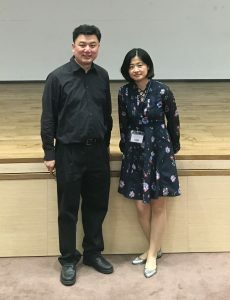 The position of Co-Principal became available and our deputy director approached me about it. At first, I was surprised and torn whether to take this path. 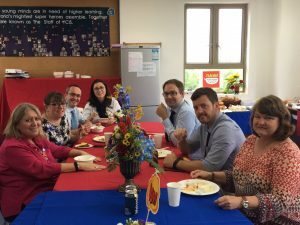 I had been Vice Principal at CP for Secondary and wasn’t sure if I was ready to be Co-Principal for Primary and Secondary. Now I am glad I took this big step, as I enjoy working in this position. 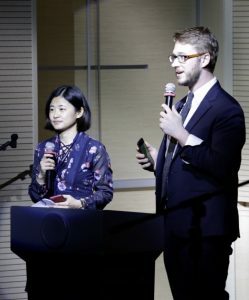 How did you like Principal being auctioned at the recent Spring Charity Brunch? Damien: As soon as this proposal came up and the POP Core Committee approached me, I was excited. I loved the idea! It has been a fantastic day and a good experience. 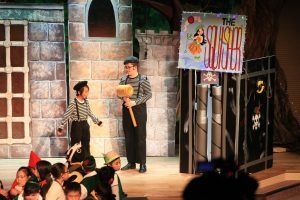 Mary: I really quite liked the idea, and it was very interesting to see how parents perceive the role of the Principal – how important the position is and how much fun it was to be auctioned off. 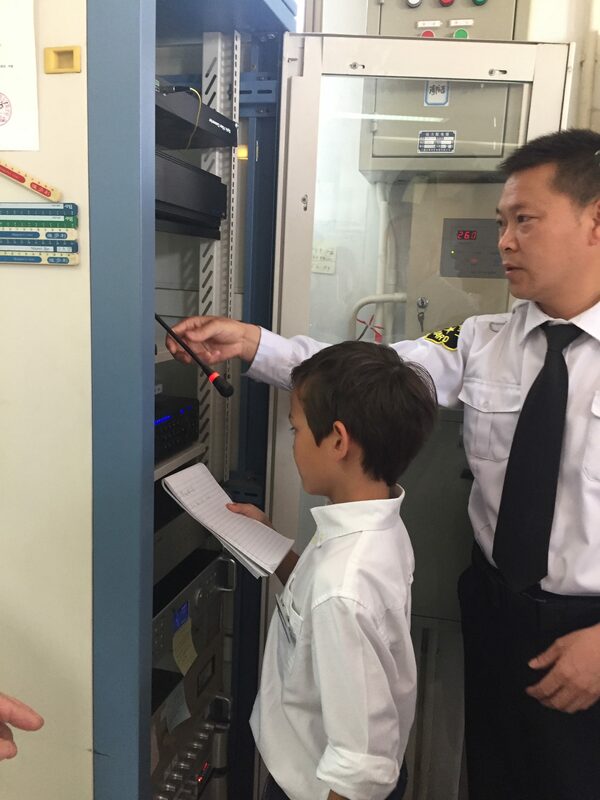 How did the “Student Principal” do as “Principal for a Day”? Damien: Jake did really well and I think he has a lot of potential to be a future principal. He was very mature and took each task on seriously but we still had some fun which is important in this job. 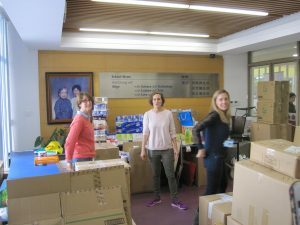 Mary: It has been great! When the other students and the parents saw Jake this morning doing Gate Duty and welcoming our families, they were surprised and happy to see this extra addition to our leadership team. 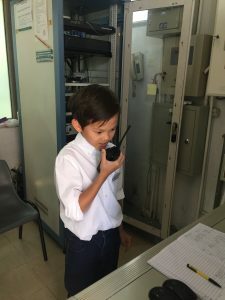 He has taken his job very seriously and I think he might be a future teacher or even principal. What would you recommend or say to a student who is one day wanting to be like you, a Principal? Damien: You have to be a good teacher first, you have to have a passion for education and be willing to work hard in your own studies. Being a Principal comes with great responsibility but it is also very rewarding. Mary: Work hard! It’s a hard job to be any kind of leader there might always be difficulties and challenges, but if you remain calm and focused you can meet these challenges. Always try your very best, that way you will be able to enjoy the process, and don’t worry too much about the outcome. How do your kids like you as being Principal of their school or being a Principal? Damien: For my girls, it’s all they’ve ever known – I think to them it is really not a big deal and just part of their normal life. They enjoy having their dad at school, but to be honest I don’t even get to see that much of them during the day. 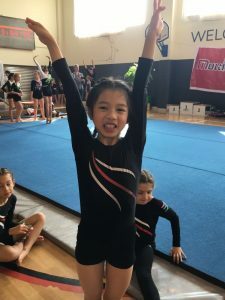 Mary: I think for my daughter (who does not attend YCIS) – it is maybe a little more special and I think she sometimes likes to show off a little at her school. So I tell her, this is just my job, and you shouldn’t say too much, so you don’t put any pressure on your teachers. 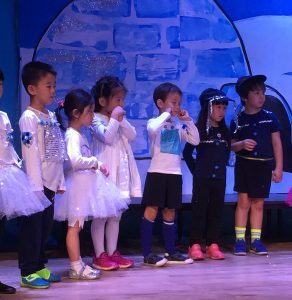 When I go to her school, for a parent meeting, for example, then I am just that – a parent. What has been your proudest achievement at YCIS? Damien: I don’t think I can just single out one. I am quite proud of our academic results that we are scoring in the ISA test and over the years, that’s been quite a significant improvement. I am proud of new opportunities for students that we as a team have introduced such as YCIS sporting teams and the spring musical. I am proud of our work on Child Protection. 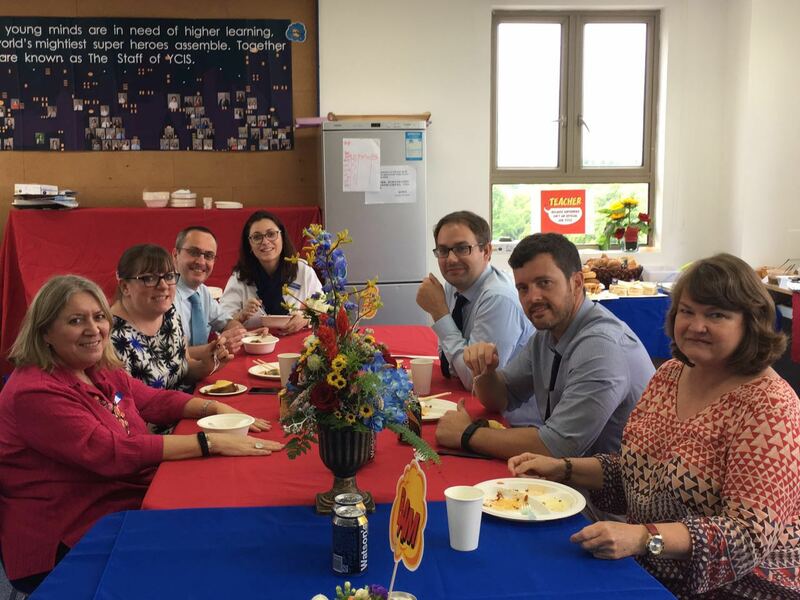 It is great to see staff development; when I see someone who started as a teacher and is now thriving in a leadership role, and having played a part in that. 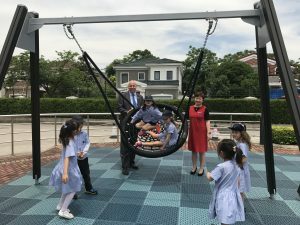 One of the most recent achievements is certainly the new play structure! Mary: In my first year as Co-Principal, I was still teaching. 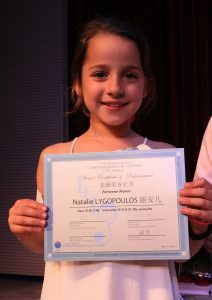 I taught Chinese language A on the IB level. We had one student in that year’s graduating class who had been my student since K4!! 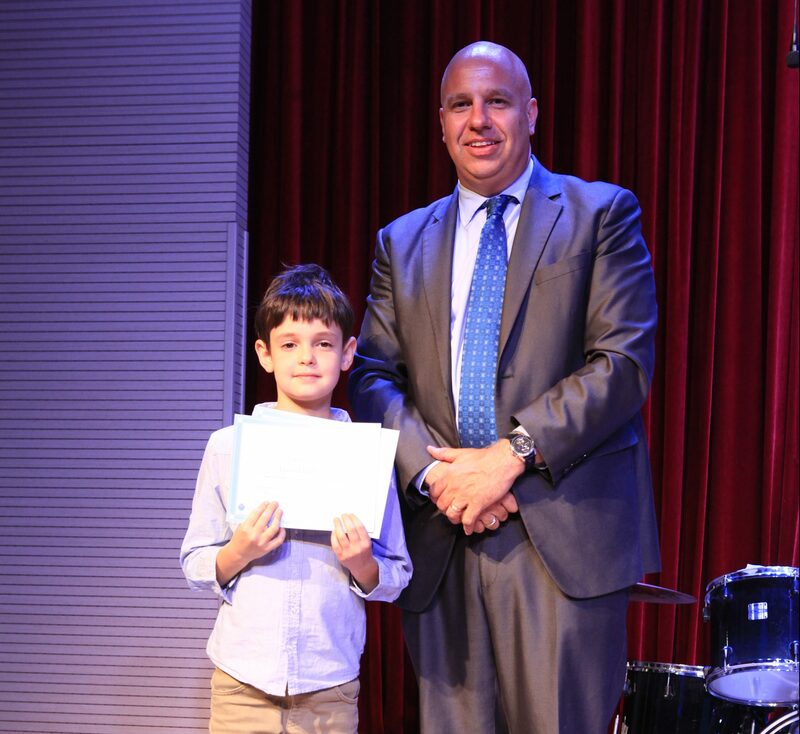 It was amazing to have seen this child on his academic journey from Kindergarten to graduate, and he even made it into one of the top universities – Pepperdine. 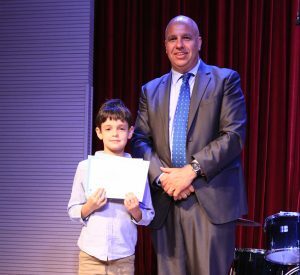 He also gave a speech at his YCIS graduation, representing his class, and it was a special moment when he thanked his teachers and said he was especially thankful for my support and guidance. Thank you both so much for taking the time and giving our community the opportunity to get to know you better. 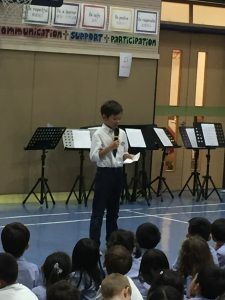 Do you have any closing comments you would like to share with our parents? 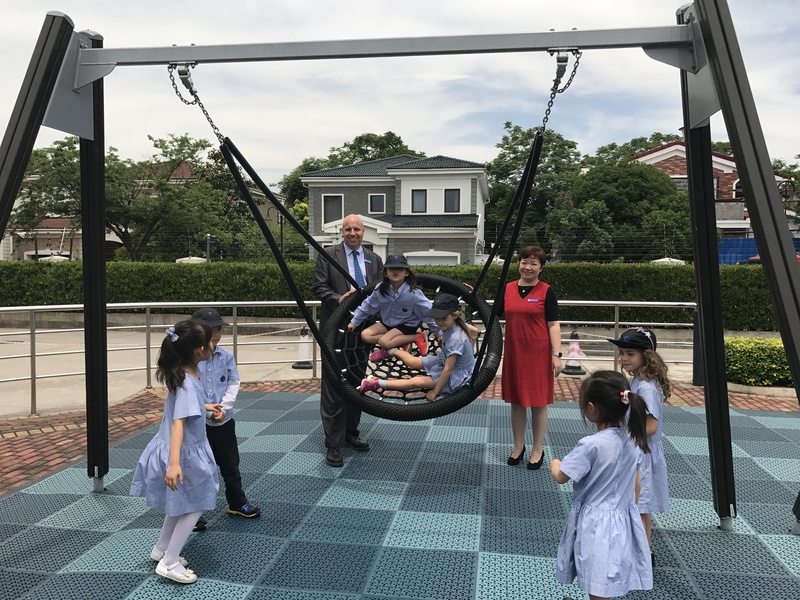 Damien: I think being a principal is a big responsibility particularly as parents are trusting us to keep their children safe and cared for at all times. 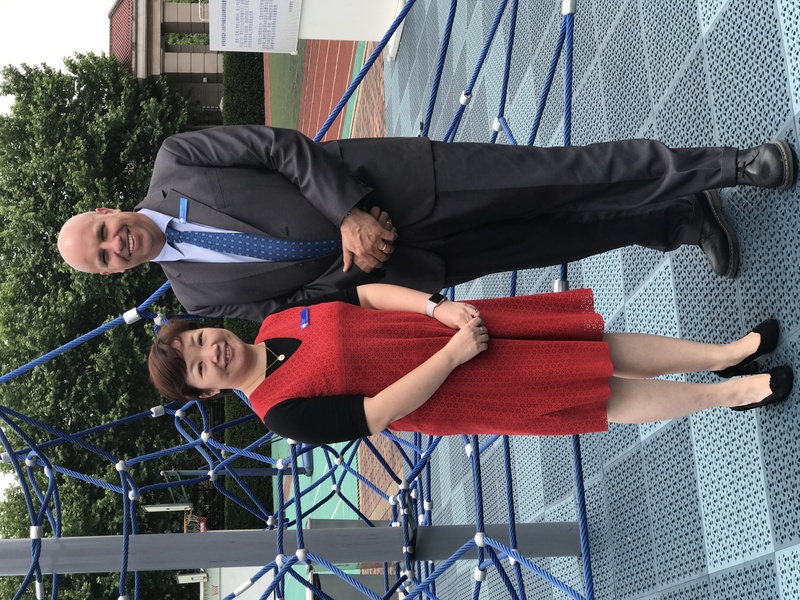 At the same time, this is such a rewarding position because I get to know so many of the children and work with professional and caring staff. It is also a great pleasure to meet the passionate parents in our community who care about our school and what we are trying to do. I feel like I have the best job in the world. Mary: I would like to always encourage parents, that if they have any questions or concerns to come and talk to us. 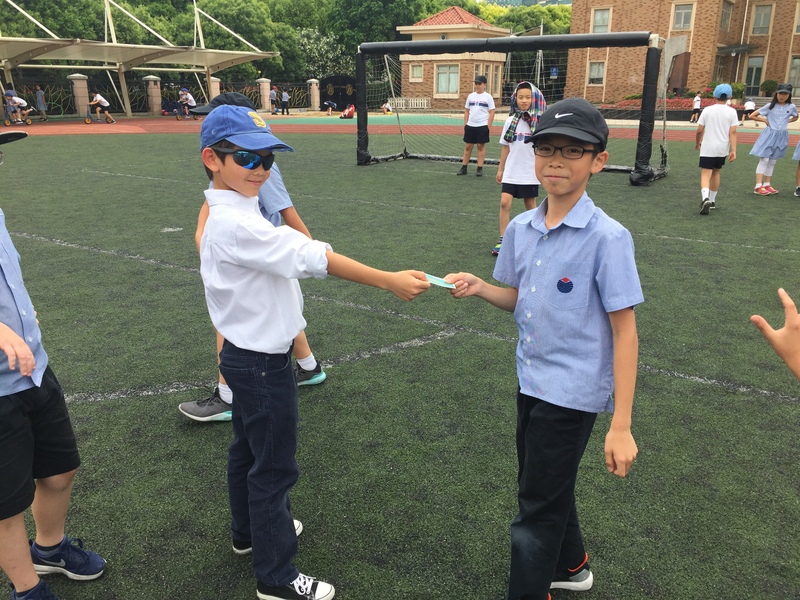 We practice very open communication and love to work with you – the parents – to make our school community better. At the end of the day we both care about the same thing: Our children! Who and What is POP? “What and who is POP?” was the first questions I asked 2 years ago, being new to Shanghai and, in general, new to ex-pat life. 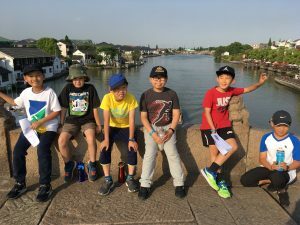 I quickly learned that POP stands for Parents Organization Pudong, and while it is lead by a core of very committed individuals, it really embodies ALL of the parents of the YCIS children. Life as an ex-pat can be filled with many exciting adventures from starting new businesses, taking classes to learn something new, and/or being more involved with our kids, their school, and the community. POP has offered any and all of these through many events over the years. 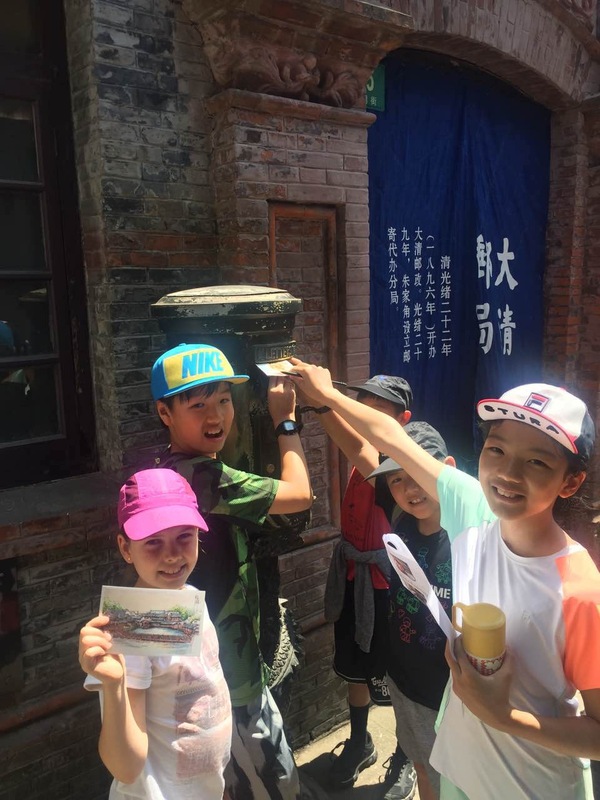 Going on tours to familiarize us with hospitals in Shanghai, exploring the old and new parts of town, as well as visiting markets and water towns are just some of the activities POP has offered this year. Not to mention, touring some fabulous restaurants has been great in getting to know other parents of YCIS…who just arrived, who have been here “forever” and who are sharing their knowledge about where to find the best quality deals! 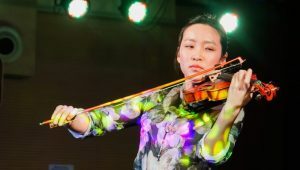 I’ve learned also that, just among the YCIS Community, there is so much talent to be explored and shared! We have had workshops held by parents who have skills and interests in various fields such as Art (Chinese Calligraphy/painting, jewelry making, Mandala etc), Holistic Health, Traditional Chinese Medicine, Nutrition, Cooking, AND recently we even had exercise and yoga classes on offer! 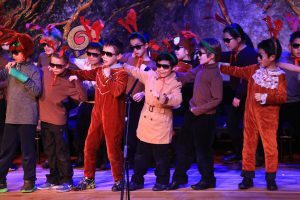 Our YCIS community is a goldmine for talent! 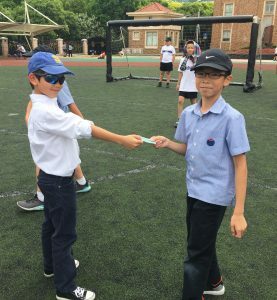 This school year, I had the opportunity, along with 2 other wonderful Co-chairs, to lead a great POP Core Committee that is dedicated in holding school social events throughout the year to foster a strong sense of community within our school, but also within the greater community of Shanghai. These events started with the Welcome Gathering and Picnic Bazaar at the beginning of the school year, Tree-Lighting and Giving Tree mid-year and culminated in the Spring Charity Brunch, Global Child Day and Staff Appreciation Day. Each of these event is organized by the POP Core Committee, but without the tremendous support of the parents of YCIS it would be impossible to carry them out. 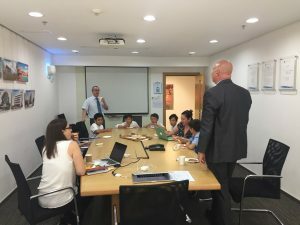 As the end of the year approaches, the planning of the calendar and events for next school year has started. 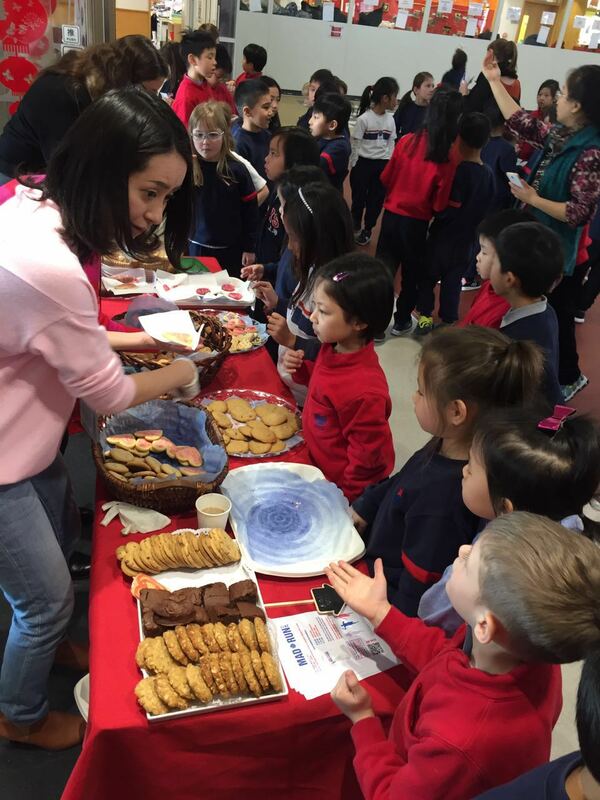 We are always looking for MORE involvement from our YCIS parents! Consider sharing what you love to do and do well by leading a workshop – think about joining POP in any capacity! All you need to do is contact one of our Core Committee Members or stop by the SCOOP (School Community Open Officers Platform) office and talk to Nadine or Roseline. We strive to have more parent involvement; after all, WE ARE ALL POP! The IIIP (In-School Individual Instrumental Programme) is a programme designed for YCIS students to privately learn a musical instrument during and after school hours. 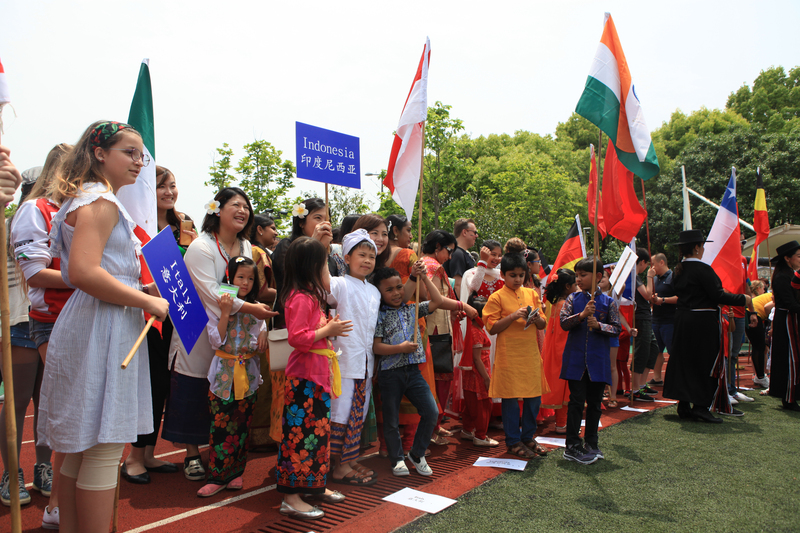 Over 120 students are learning an instrument and lessons are offered on piano, violin, voice, cello, guitar, drums and Chinese traditional instruments. 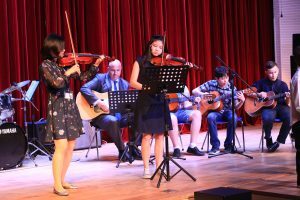 The annual IIIP Recital is open to all IIIP students and together with their IIIP instructor they choose a musical piece to perform. 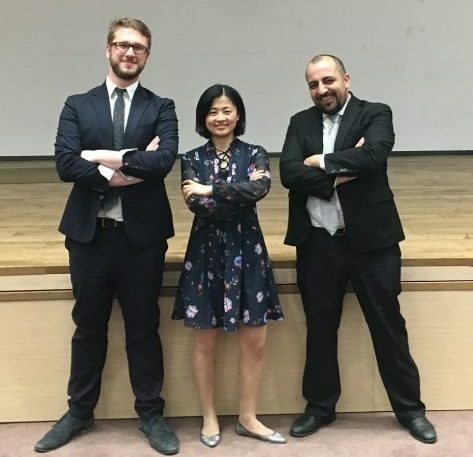 This year was our 3rd annual recital and the IIIP Officer, Ms. Judy Song works closely with Mr. Swider and Mr. Adgemis to prepare the programme. 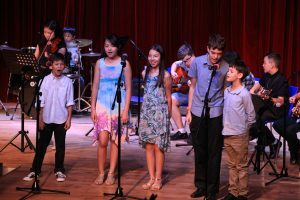 Participating students are welcome to perform solos or in a small chamber ensemble to share their music with the audience and to showcase what they have learned on the stage. 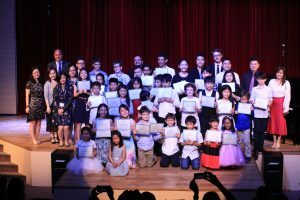 This year, we arranged the recital over three sessions at Century Park Campus Theatre to allow all 120 talented musicians from ECE to Secondary to perform in front of their families and friends. 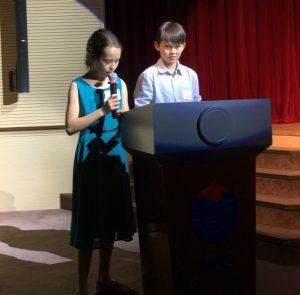 We invited six of these students to act as the MC for each session. It was not surprising that all of them did a fantastic job, as it can be very difficult presenting in front of large crowds. 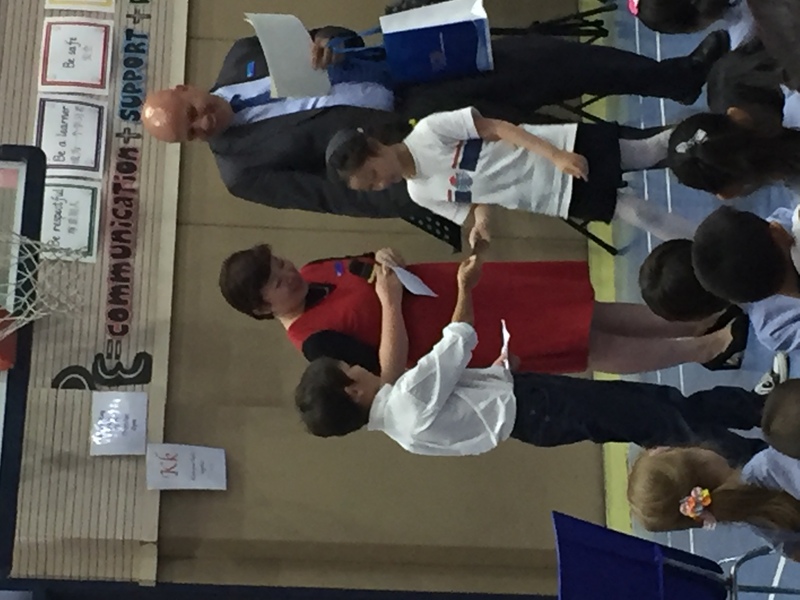 The parents of the MCs also helped out with the scripts and showed great support to their children and the IIIP. 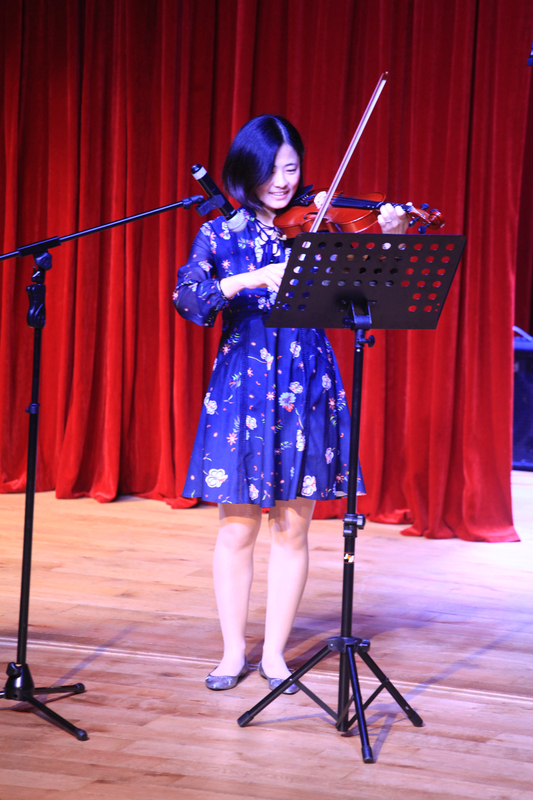 Ms. Judy Song also gave us a surprise when she performed on the violin for the first time in public. 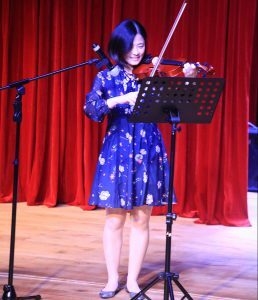 To better understand IIIP students and the programme, Judy took violin lessons herself, for over a year, until she felt ready to perform. 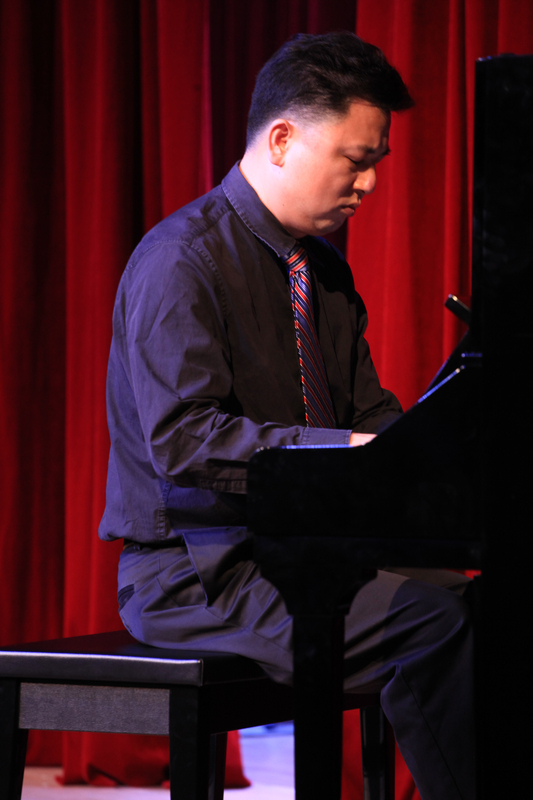 Following Ms. Judy’s performance, guest pianist, Dr. Yu Yueng, wowed us with his emotive playing. As we are nearing the end of this school year, many families have already finalized their summer plans; some of us will spend their summer travelling or exploring, others will “go home” – back to their home country to spend time with friends and family. 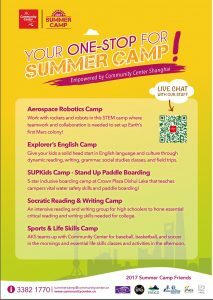 However, not all of us will be on the move – if you are spending part or all of your summer holidays right here in Shanghai, and are still looking for some fun activities for your children, look no further! 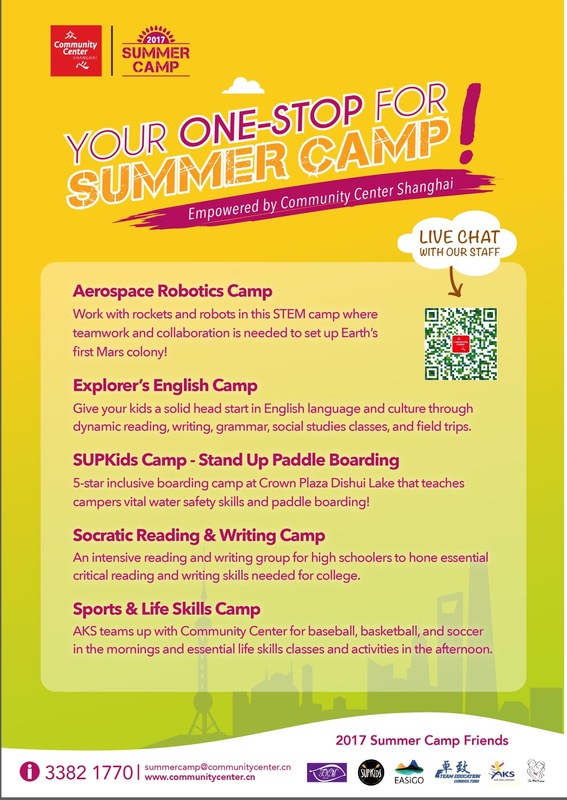 We have put together some comprehensive summer camp information for you and yours. As part of the Yew Chung Family, the Yew Wah Art & Language school offers a summer camp where you can enhance your English or Mandarin Skills, paired with other activities. 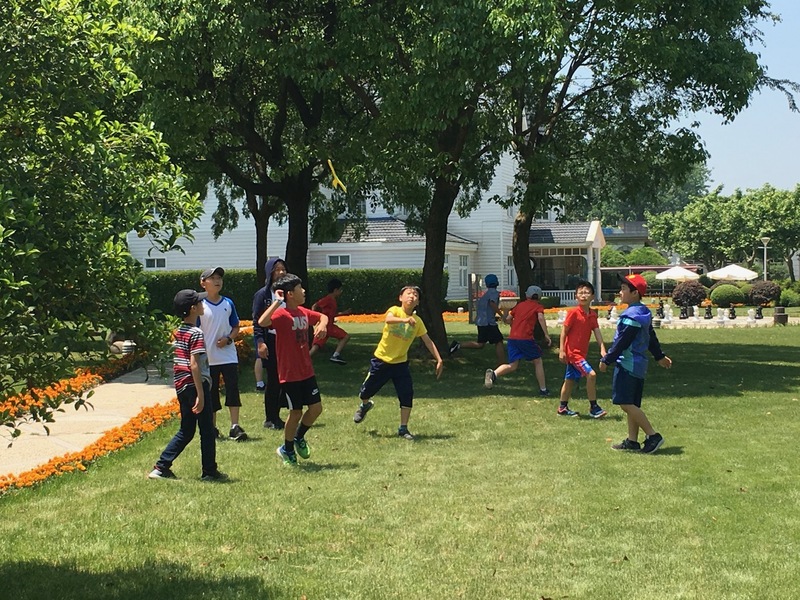 The MultiSport Summer Camp will be running fun activities and a wide range of sports like swimming, gymnastics, football, tennis, dodgeball and trampoline all summer long. 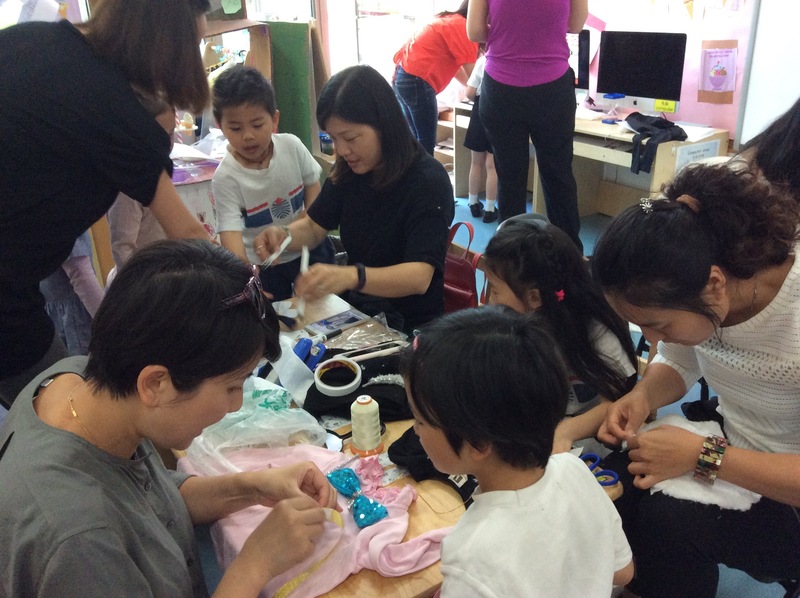 Each day will also contain 1 arts and craft session, which involves activities like designing T shirts and Ceramic painting. Sport for Life is running a Mixed Sport Camp (age 4-14) which focuses on teaching children a wide range of skills in a number of sports, such as soccer, swimming, basketball and tennis, to dodgeball, baseball and archery. 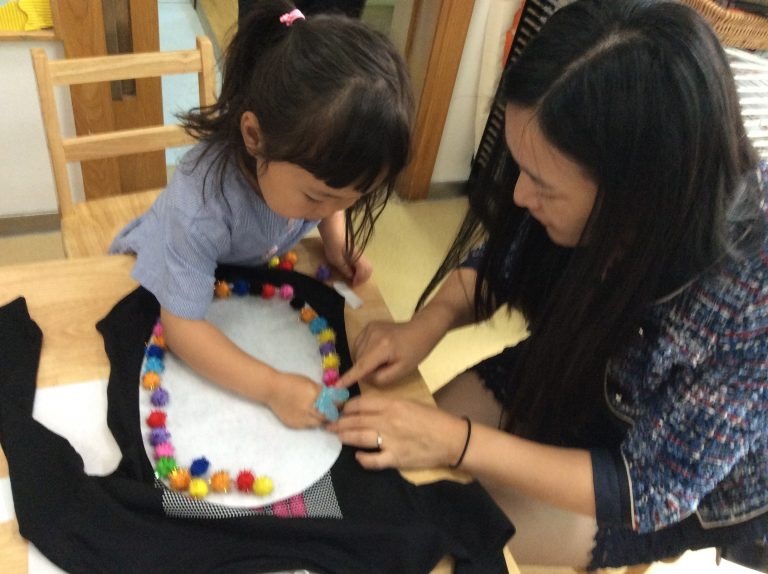 These activities are paired with other arts and crafts activities. 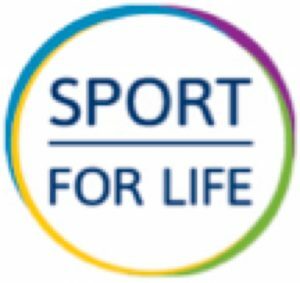 Sport for Life is also running a Soccer Camp (ages 6-14), which is designed to help improve fundamental skills from passing, shooting, skills and tricks. Children’s Boutique offers a variety of summer fun camps, both full and half day during the week (such as: Tennis, Kid’s Golf, Yoga, Creative Writing, Theater, Swimming and Arts & Craft), as well as some Weekend Adventure Workshops (Yoga, Clay & Sculptures, Modern Dance, Kung Fu and Jewelry Design). 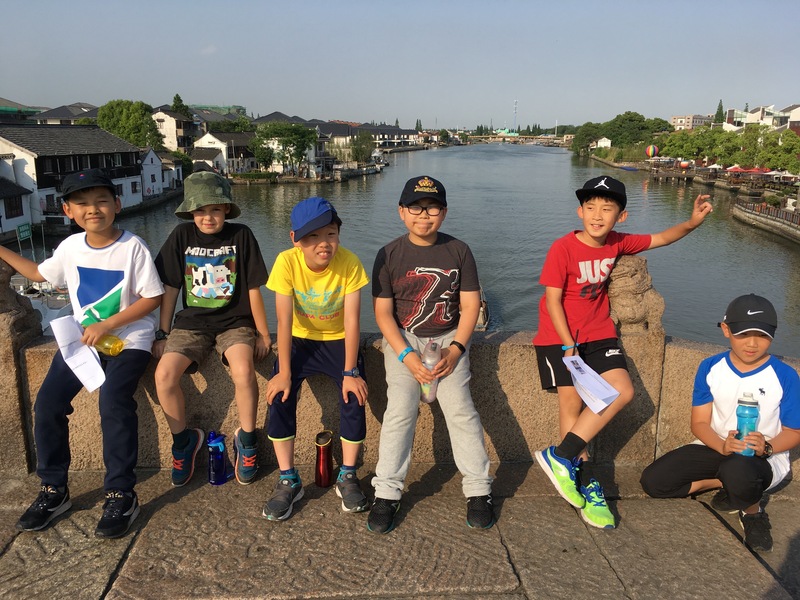 Year 5 recently returned from their 3-day camp near Zhujiajiao, in the Qingpu District of Shanghai. Here, three students tell of their experiences. 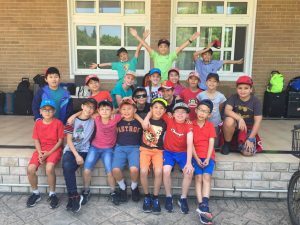 Camp was a chance for us Year 5s to show that we could be responsible for ourselves. At first I was a bit worried about going to camp because I was worried about sleeping away from home. But I heard from Year 6s and my fellow students that camp was going to be fun, so I didn’t worry too much! The bridges activity was the best part for me, especially when Mr. McEnhill fell into the water on one of the bridges! Most of group one laughed when he did this. Ms. Shen videotaped it! The obstacle course was the most challenging for me because most of it was high, and I was scared of heights. There was also a challenge on the obstacle course where we had to get a cup full of water from the start to the end. Our group spilled some water, but it was still fun. On camp, I learned that I could be responsible for myself when I have to. What we liked best was the bridges, they were very exciting and fun and a great challenge. Something that we weren’t expecting was how awesome the hotel was! We also didn’t expect to feel so confident on the confidence course which made us feel strong and brave and really proud of ourselves. 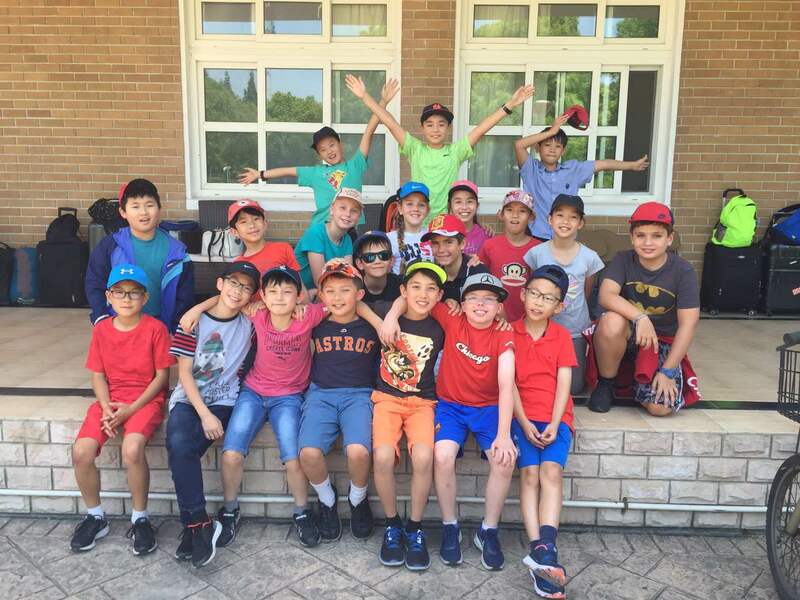 The biggest lesson we learned from camp this year was that all the Year 5 classes made a great team when we all got together and that we shouldn’t be afraid to give anything a try. Also, we had a taste of being an adult because we had to look after ourselves and practice new skills of being independent. Overall, camp was a fabulous experience and something that we will never forget. Camp was one of my favourite experiences so far. My favourite part was the confidence course, and the bridges. I liked the confidence course because some obstacles were challenging and helped me learn that not everything will be easy. The course, which includes balancing, climbing, and fear conquering, was really fun overall. The bridges really helped me gain control of what I was doing. It also helped me gain balance skills to cross the bridges. It did this because some of the bridges were really narrow. The bridges, which also includes climbing, fear conquering, and jumping, was really cool to have this once in a lifetime experience. Besides the opportunities I had, I think I learned a lot. We were in a room by ourselves, and this taught us to be mature without anyone telling us what to do. 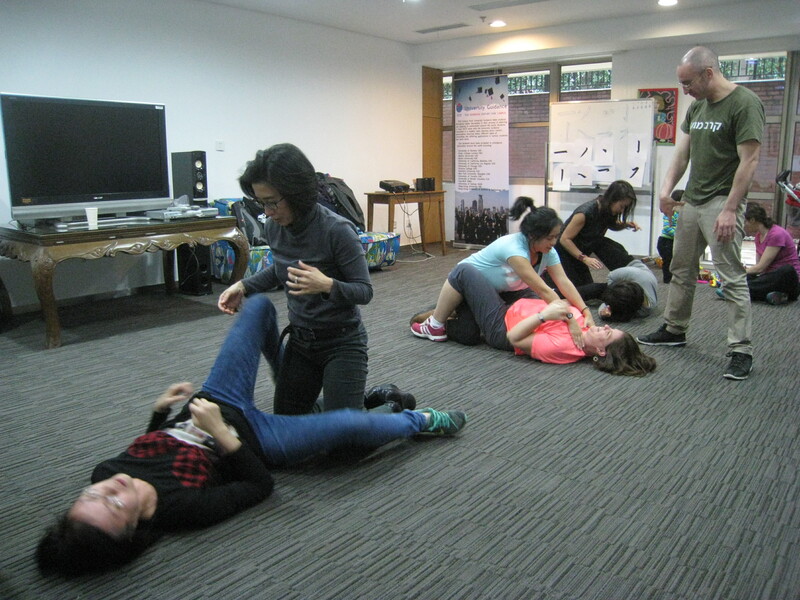 I also learned team building activities when doing a lot of the activities. 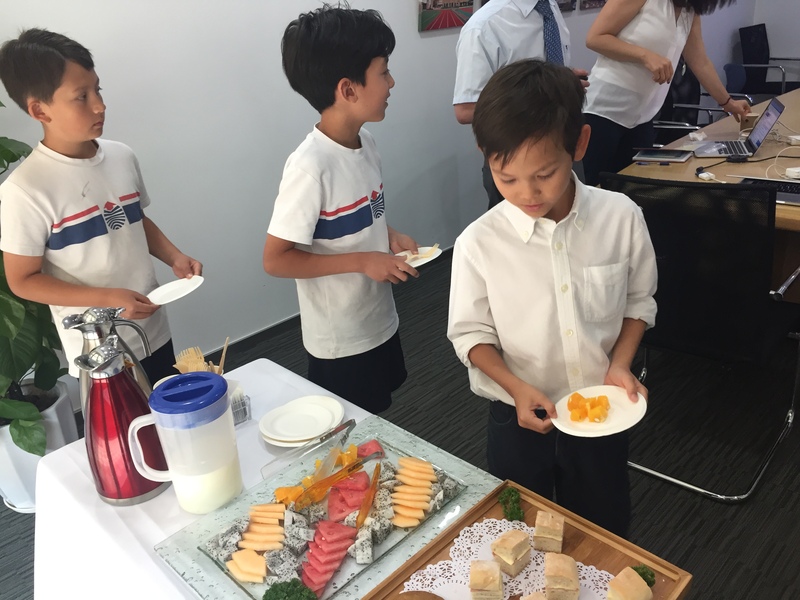 The food there was delicious because everyone used a growth mindset to try everything. 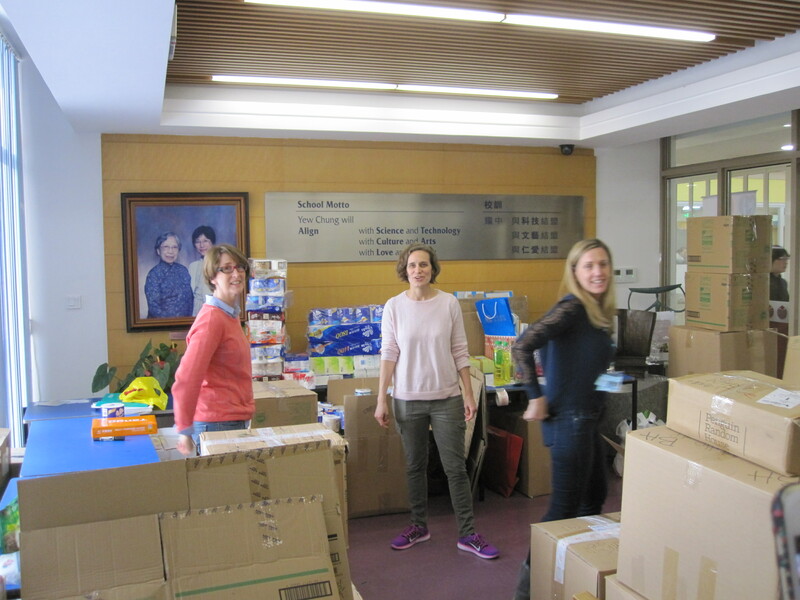 A lot of responsibility was laid upon us, but I am sure everyone is just happy we came back in one piece. 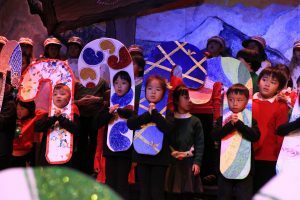 We have all seen children’s creative art work and children singing songs as they walk along, or when they are engaged in an activity. 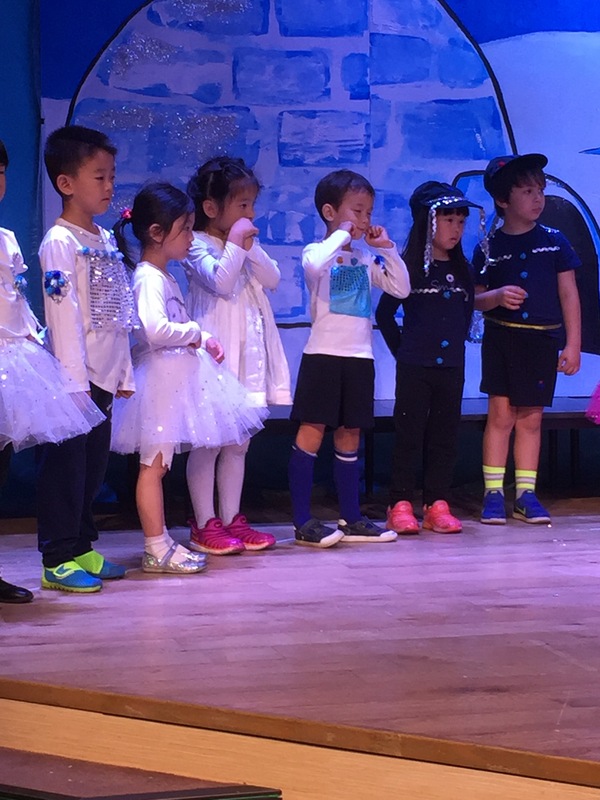 The ECE supports children to develop their creative side, providing many diverse ways for them to find their own style and preferences. 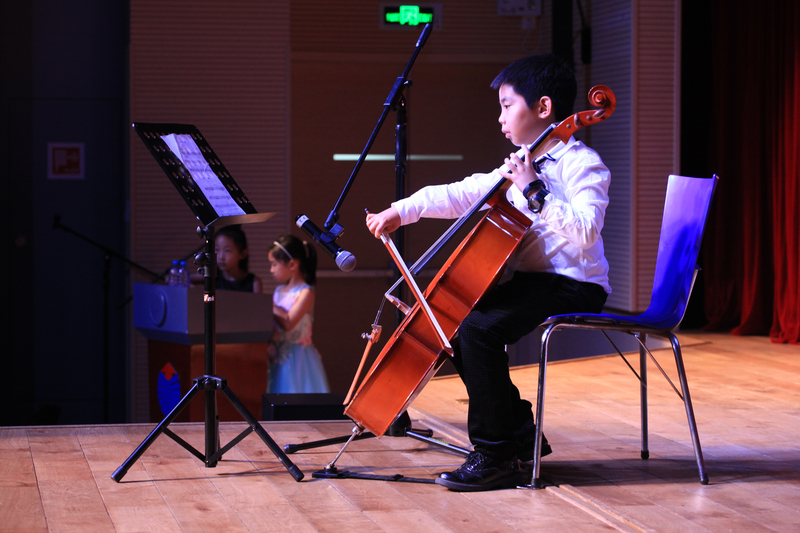 Music is one way that children can learn to express themselves and develop language skills. 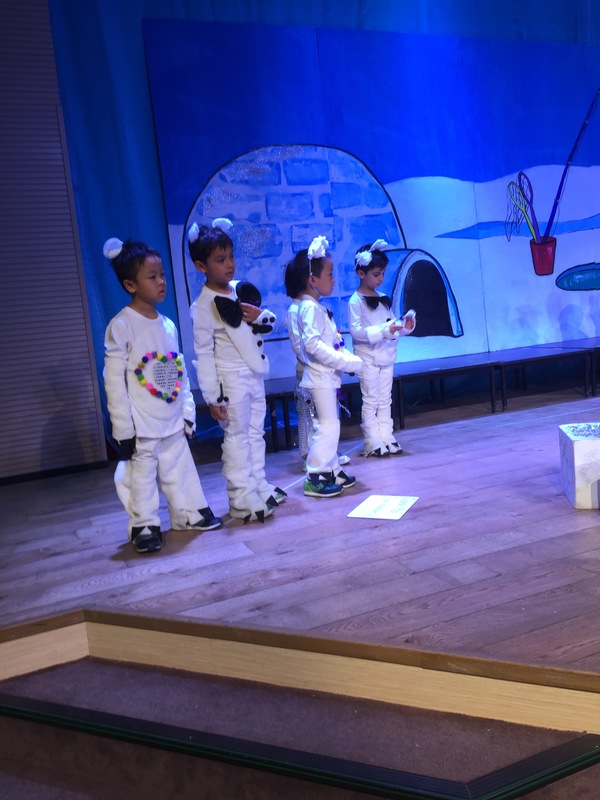 Last week all K4 students participated in the end of year Musical, ‘Seven Little Penguins’. 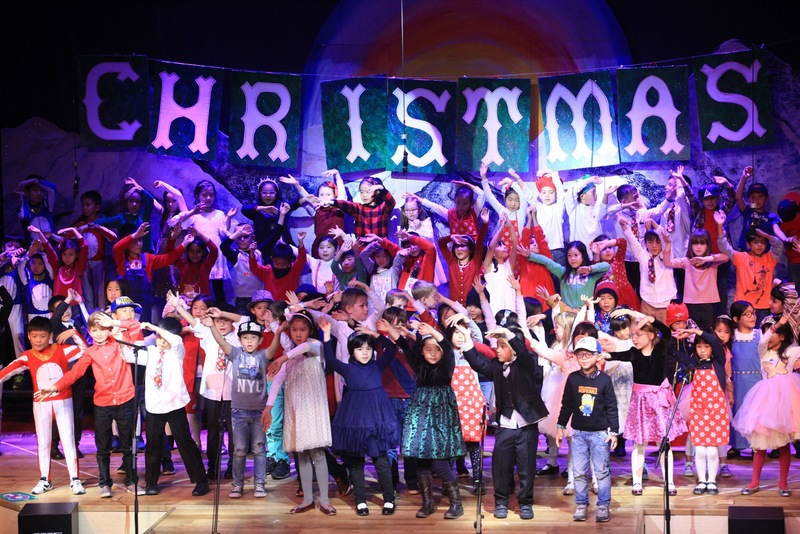 The children worked alongside the class teachers and Ms. Jeannie Jackson the music teacher to learn the songs, think about lines and decide who would be what character in the show. 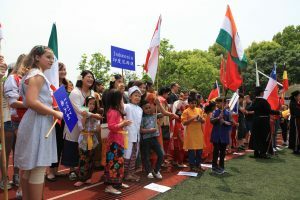 Children along with their parents, designed and created their own individual costumes that reflected their character and also the child’s personality. 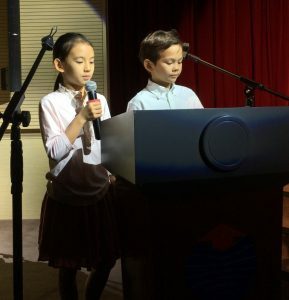 When children are given the lead on designing what they think their character looks like, their ideas are far greater than any adult could think of. 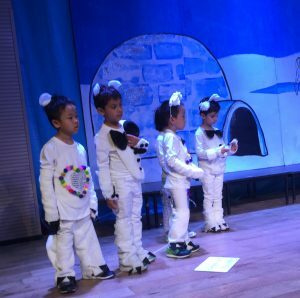 The stage was set with Penguins that had top hats, pom-poms and sparkly dresses; polar bears had glitter and sequins, all designed by the children and parents. 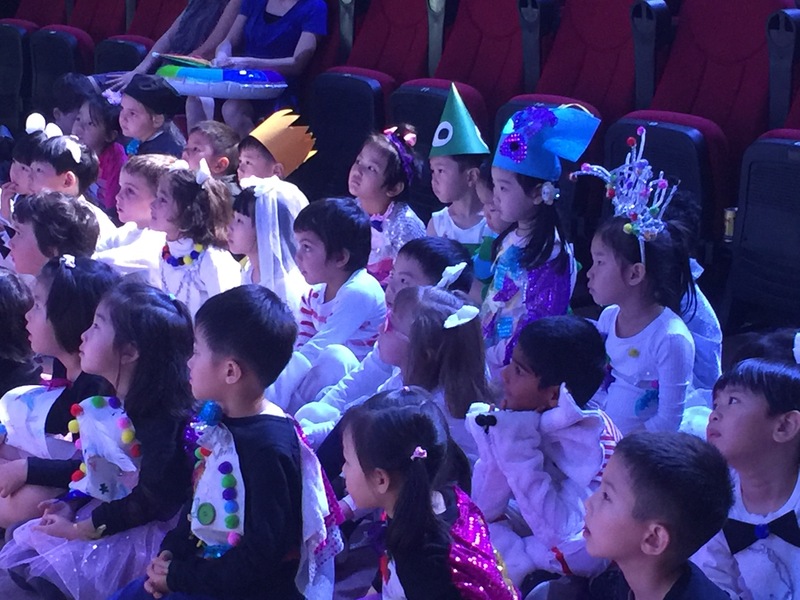 Each child wore their costume with pride and ownership. Children had the chance to demonstrate their ability to be creative and work together. All of these elements came together and a quality K4 production took place. 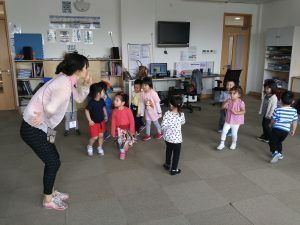 The K3 children also participate in Music lessons with Ms. Diana Dai. Ms. Diana provides music and singing that the children find interesting and that will ignite their imagination. 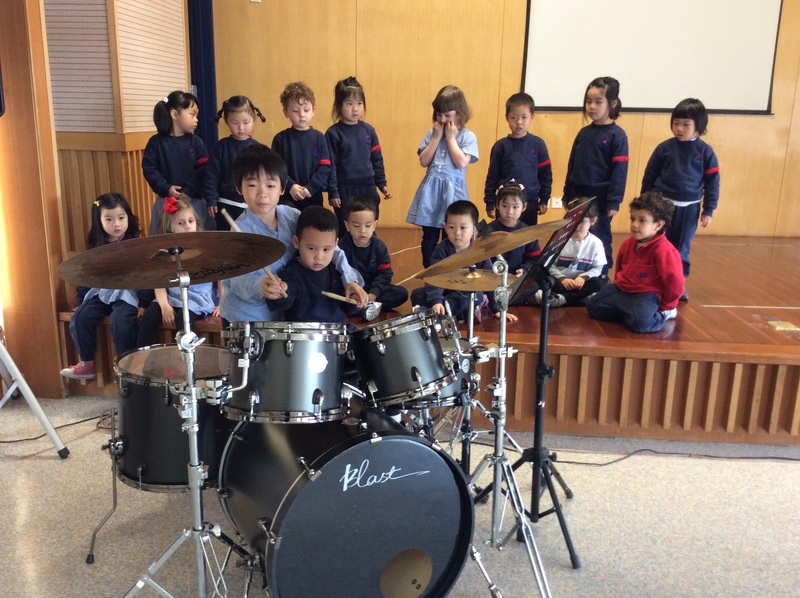 The K3A class took their interest further and started a project on drums. Hearing a beat played out upon many different surfaces was all we could hear for a few weeks. 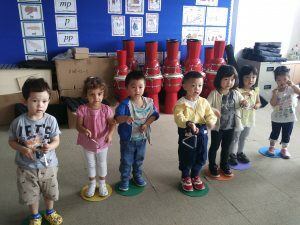 Children used drum sticks to develop a beat upon the obstacle course, boxes, pots and pans and any other surface that might hold a beat. 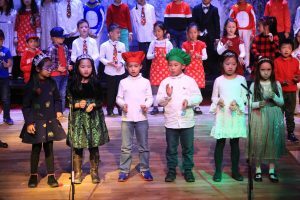 They made up songs that included Chinese and English words, and a Year 5 student came down and put on a performance for the children. 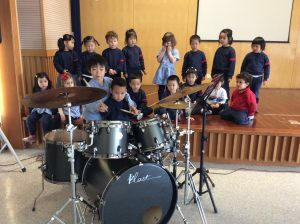 He then spent time showing the K3 children how to use the drum kit. 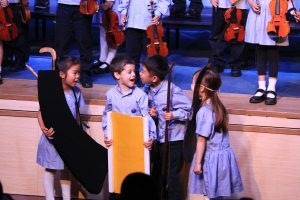 Cross-age learning allowed the young children to get to know the older student and use the platform of music to have a conversation together. Music in K2 provides a link between languages. 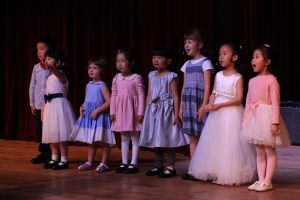 Children begin to use a new language in a basic song such as Twinkle, Twinkle Little Star. 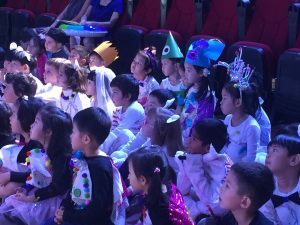 Songs that have actions allow the child to link the action to the word such as “twinkle”. 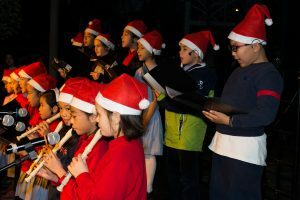 Songs that are repetitive allow the children to feel how the sounds are created with their mouth; you can often see children repeating a verse or a line from a song while engaged in other activities. 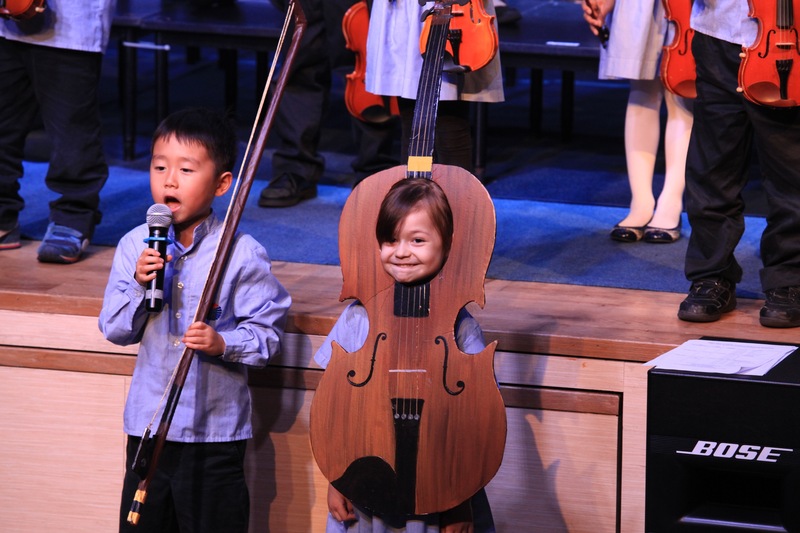 Music is so engaging and something every child can participate in with ease. Not only do they receive pleasure and enjoyment, they are also supporting many skills needed later in life. 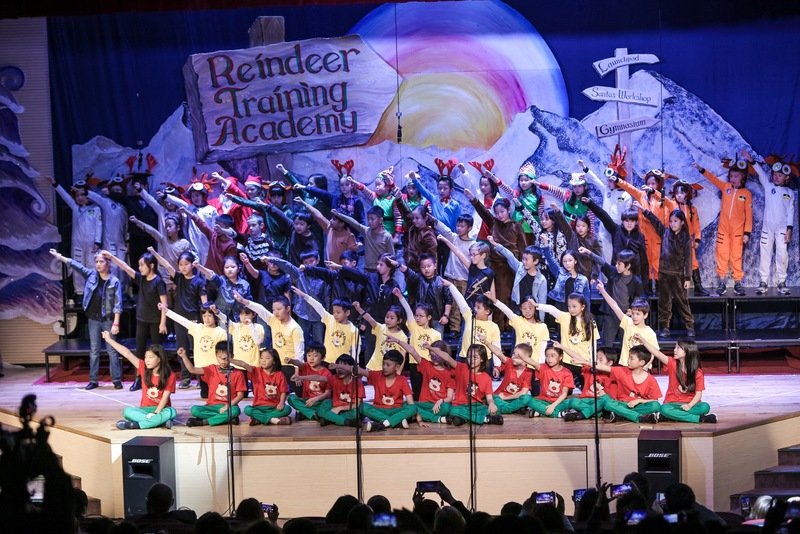 Did you know that our Music Department at Regency Park Campus organized 24 large-scale events throughout this school year? 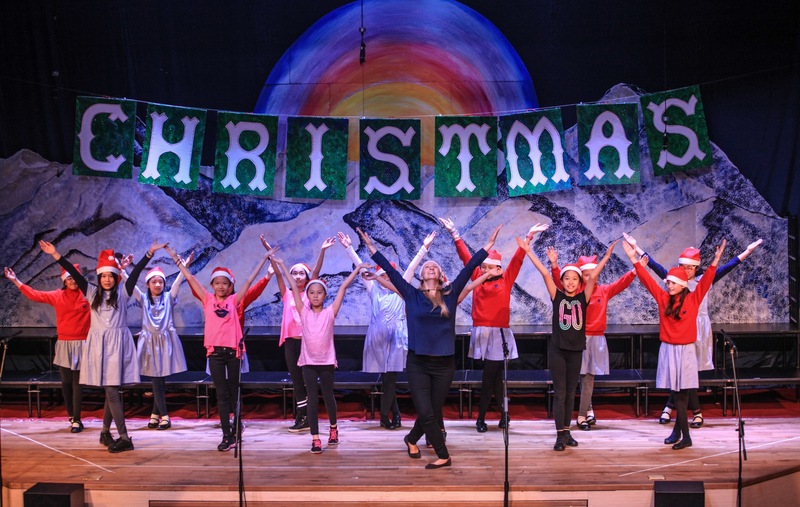 From drama productions, to year-level violin concerts, to charity performances for Seeds of Hope, the performing arts are an important aspect of school life at YCIS. Here are just a few of the events from this year. 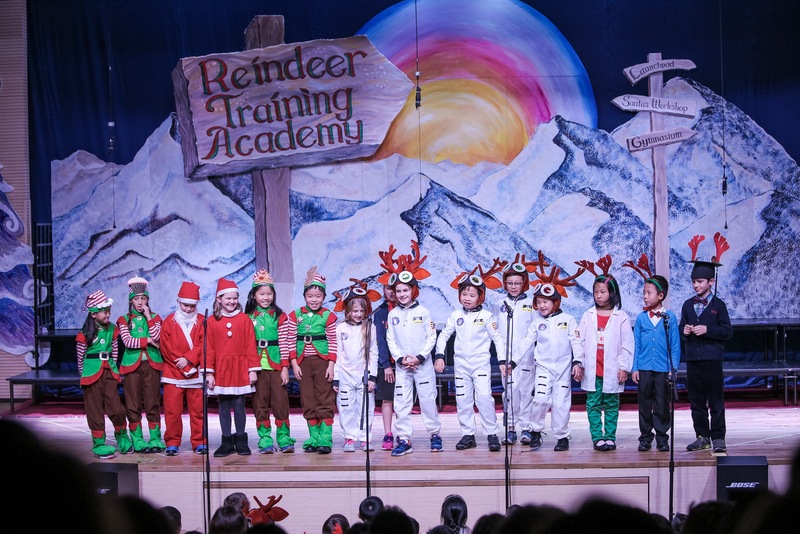 Christmas is always a busy time of year with the school year already in full swing. 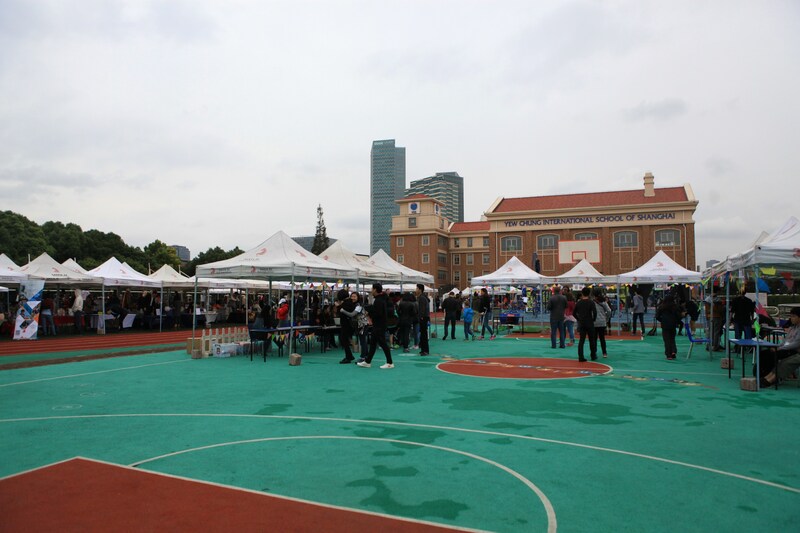 And Music events and activities are no exception. 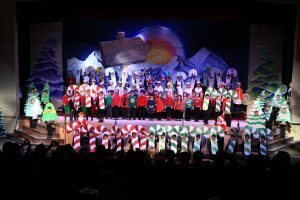 Each year level is involved in the production of a Christmas musical, complete with costumes, singing and choreography. Led by the year-level leaders and music department, students performed 5 different productions in December alone! 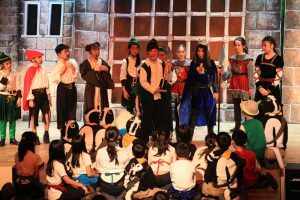 Last March, over 100 Year 5 and 6 students collaborated together to perform Robin & the Sherwood Hoodies, a musical by Craig Hawes. A hilarious twist on the traditional Robin Hood tale, our fearless hero and his merry men sang and danced their way into our hearts. One of our biggest shows of the year, it was complete with amazing costumes, stunning sets and some incredible props including a life-sized squisher! 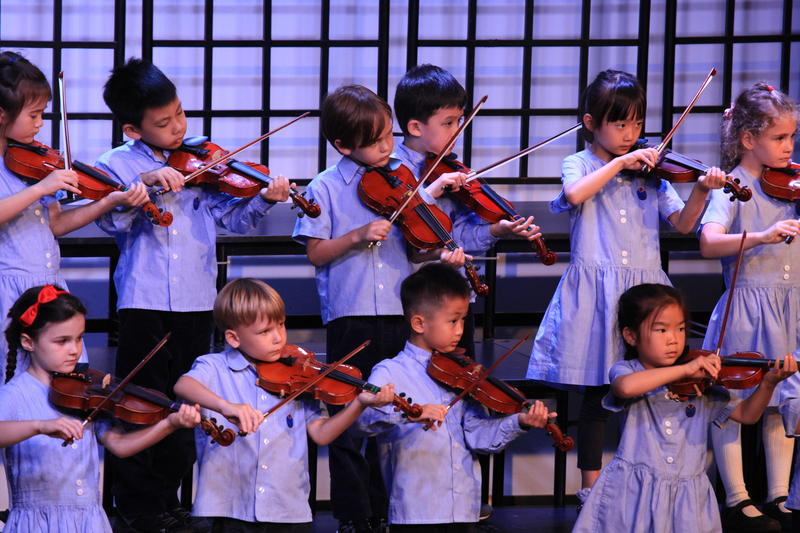 At YCIS, we have a unique violin program where children begin lessons in K4 and continue through to Year 3. 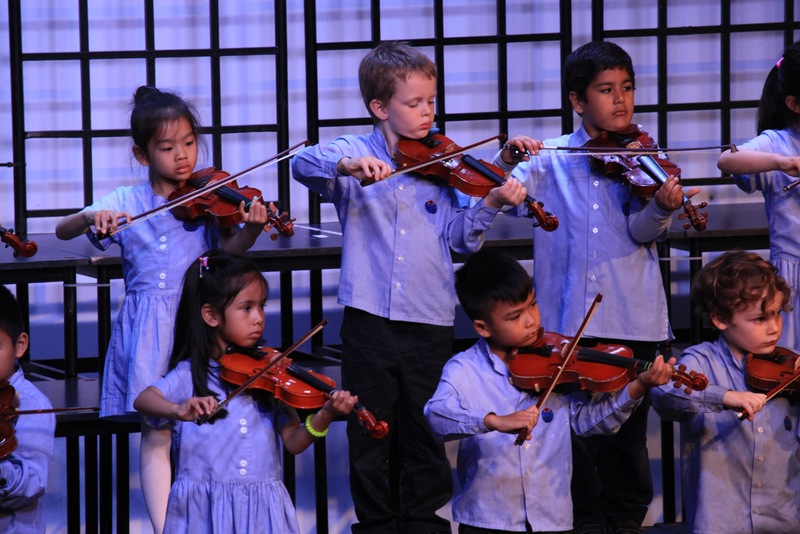 Students have three violin lessons during the course of a week – two instructional and one practice. 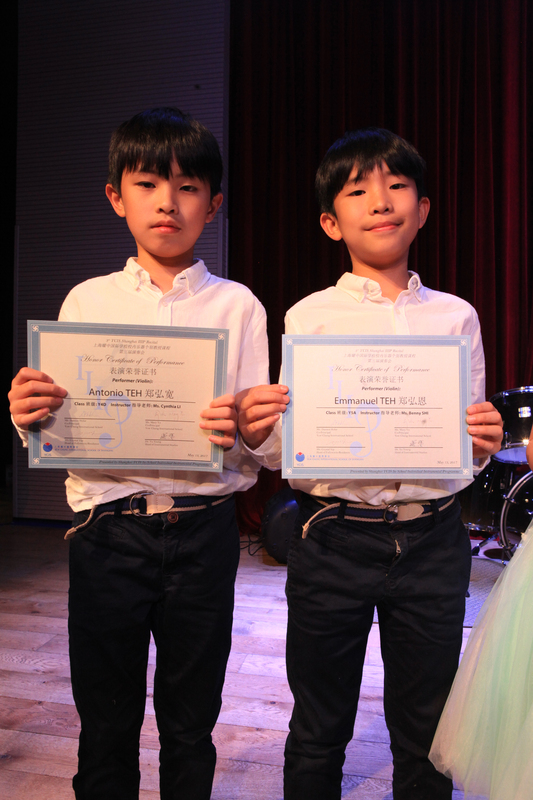 The final concerts at the end of the school year are an opportunity for students to show off all their hard work. 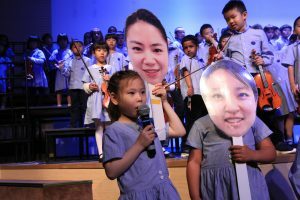 On May 5, Year 1 performed their concert to parents and friends. 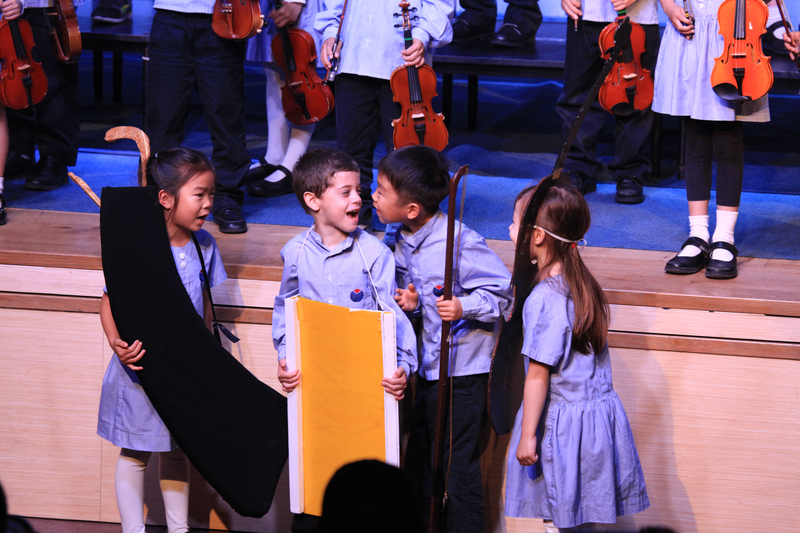 Following soon after was the Year 2s & 3s with their Star Wars-themed concert June 1-2. 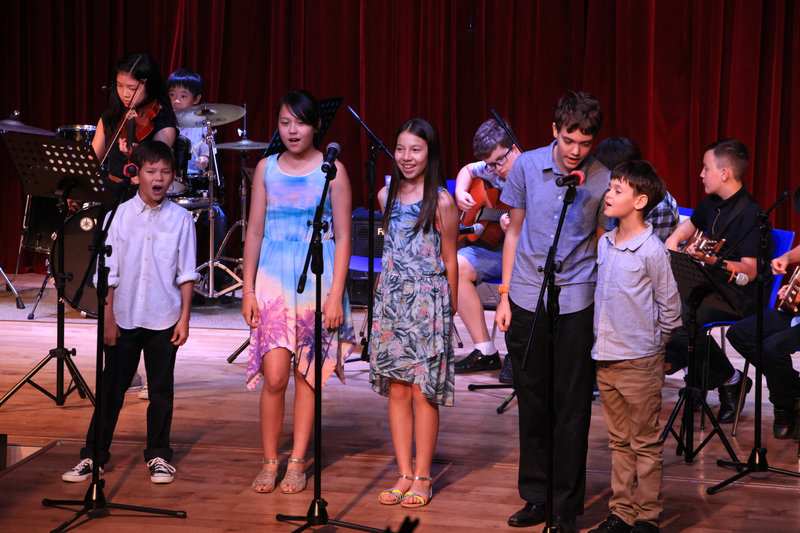 Finally, we will present the Summer Music Concert on Friday, June 23. 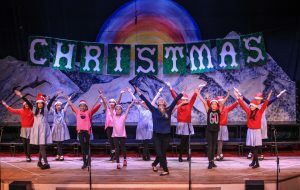 This is an opportunity for students who have participated in Performing Arts activites throughout the year, to perform to their parents and friends. 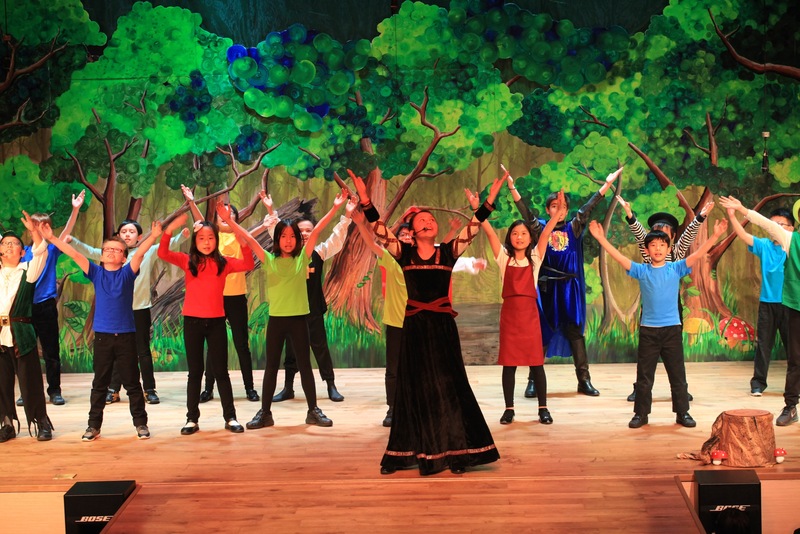 It is a true celebration of the programmes and opportunities on offer at YCIS. 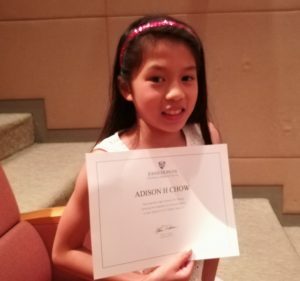 Adison Chow is a Year 4 student at the Regency Park Campus. Recently, she was given High Honors at an award ceremony from the Johns Hopkins Centre for Talented Youth. Every September,Johns Hopkins CTY has an informational presentation of their student programs for parents at our Century Park Campus. 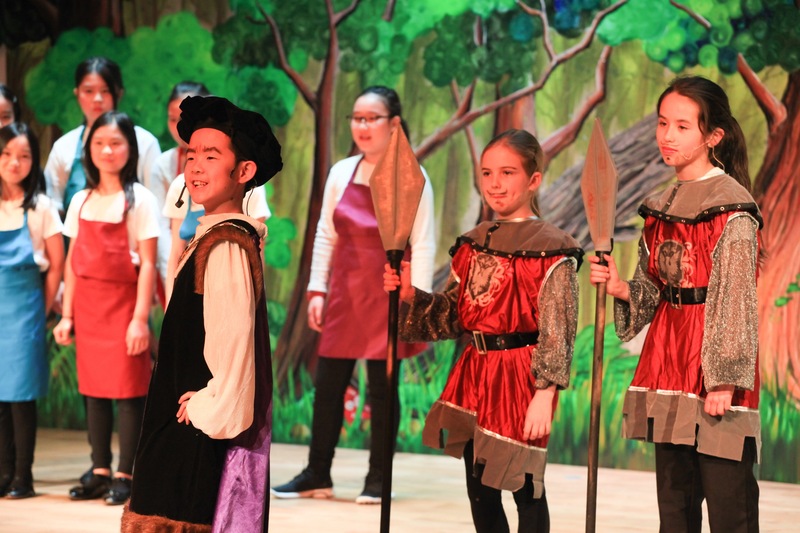 Students from Year 3 and older, who perform significantly above average in the classroom, are encouraged to take a test and participate in the Johns Hopkinss CYT academic ‘talent search’. 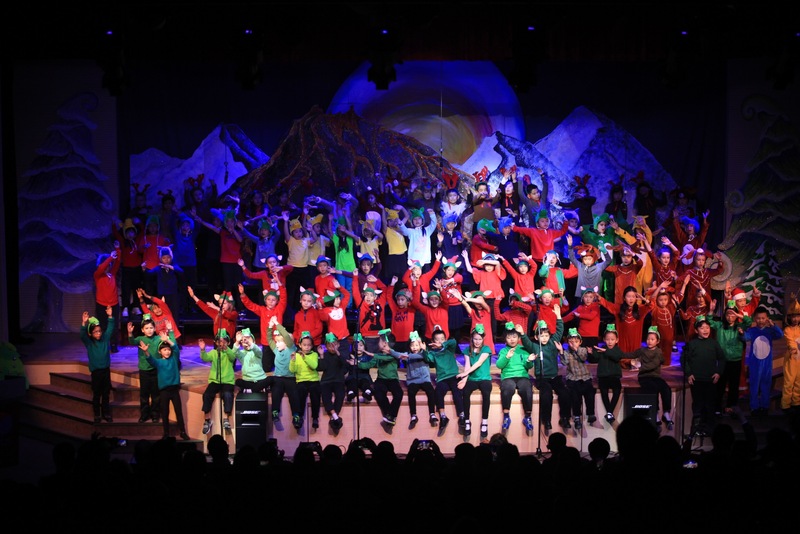 Students who are gauged as Gifted/Talented are encouraged to challenge themselves through online courses or a summer camp in various locations throughout the United States. 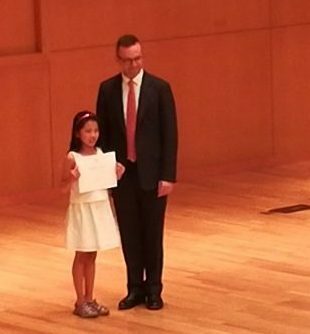 Adison was honored on May 5, 2017 at a ceremony held at Fudan University for scoring in the top 25% of this talent search, worldwide. 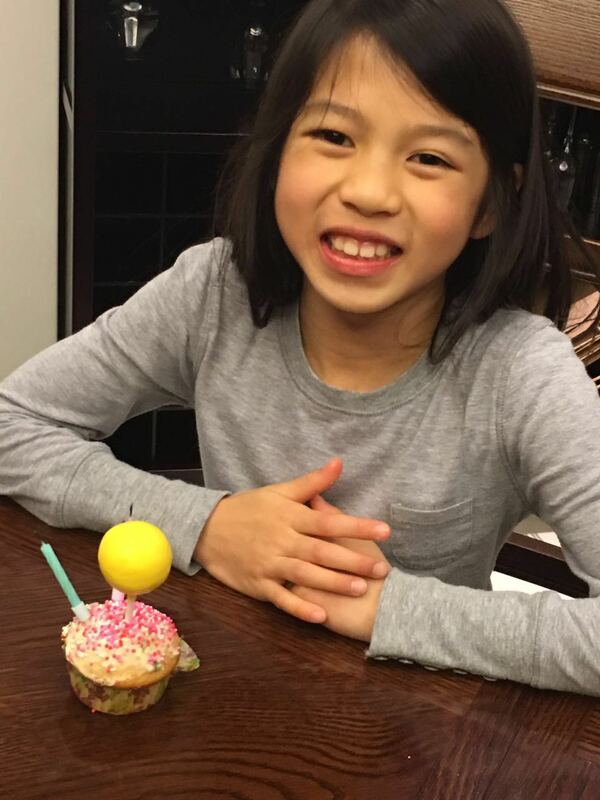 She is very excited to be participating in a Science summer camp in the US this summer. At YCIS, Adison takes part in English Extension classes. 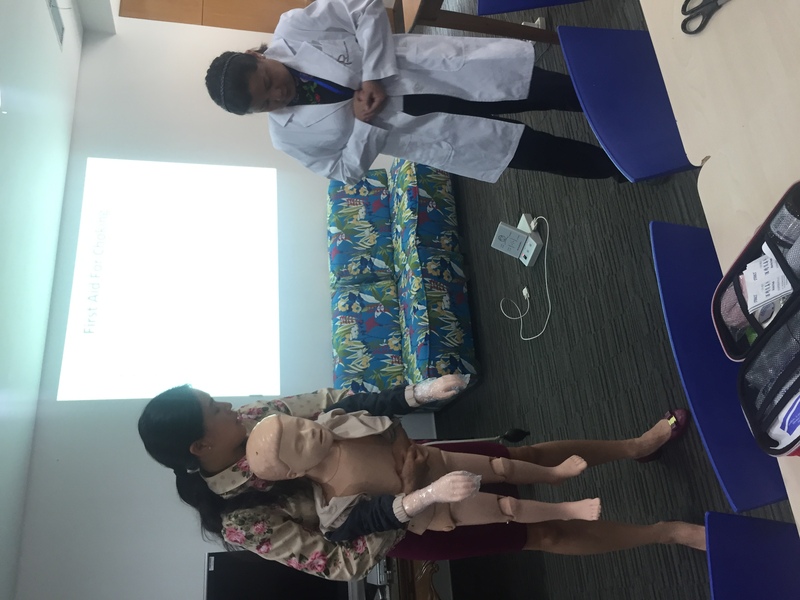 These are classes she attends once per week and are designed to challenge students whose skills are significantly above their year level. 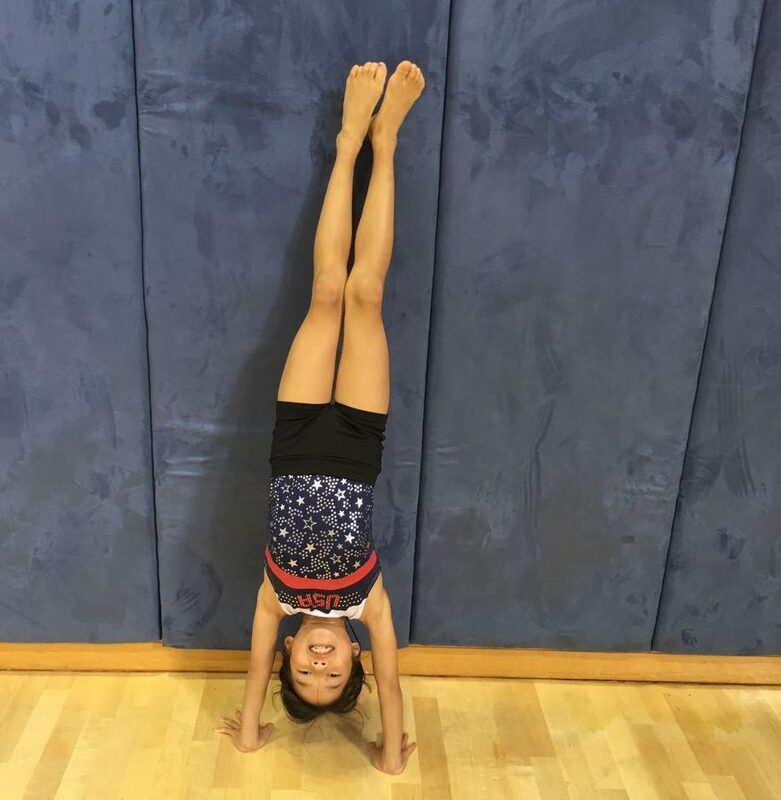 Adison also practices piano, gymnastics and swimming after school. She represented the YCIS gymnastics team at the Multi-Sport Gymnastics Gala, participated on the YCIS Swim Team and took first place in the Year 4 Founder’s Day run. 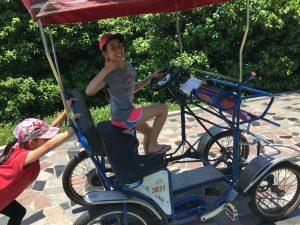 Adison’s parents feel it is important to foster her personal , as well as, academic growth. Body health is of vital importance. 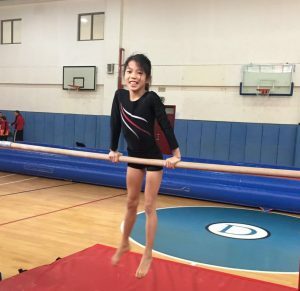 While she was born in Seattle, Adison spent time in Singapore and moved to Shanghai four years ago. This is Adison’s first year at YCIS, and has proven herself to be an active, interested learner. She participates with great enthusiasm in all subject areas. Her teachers are all very proud of her accomplishments. Congratulations to Adison on all of her achievements. She hopes to be a gymnast or a chef in the future. She is inspired by cooking breakfasts with her Dad. Whatever road Adison decides to take, we are certain she will meet the challenges with hard work and perseverance. 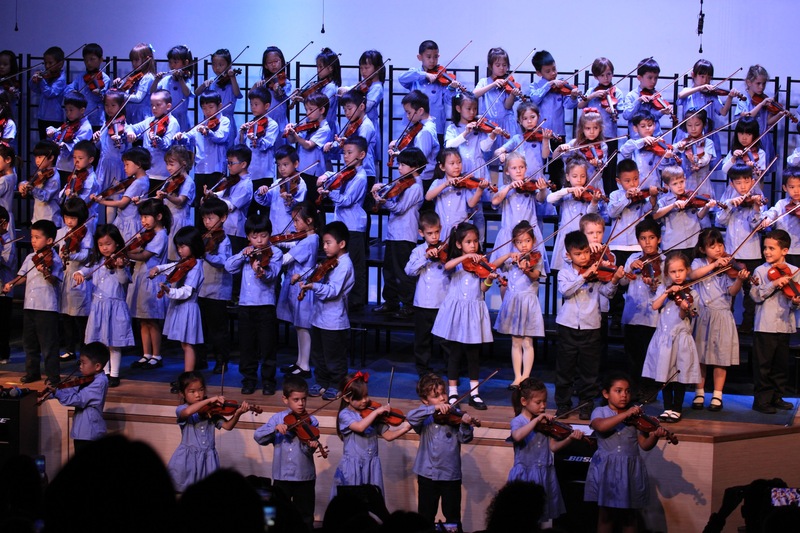 The annual Violin concerts have started with the Year 1 students performing on May 5. 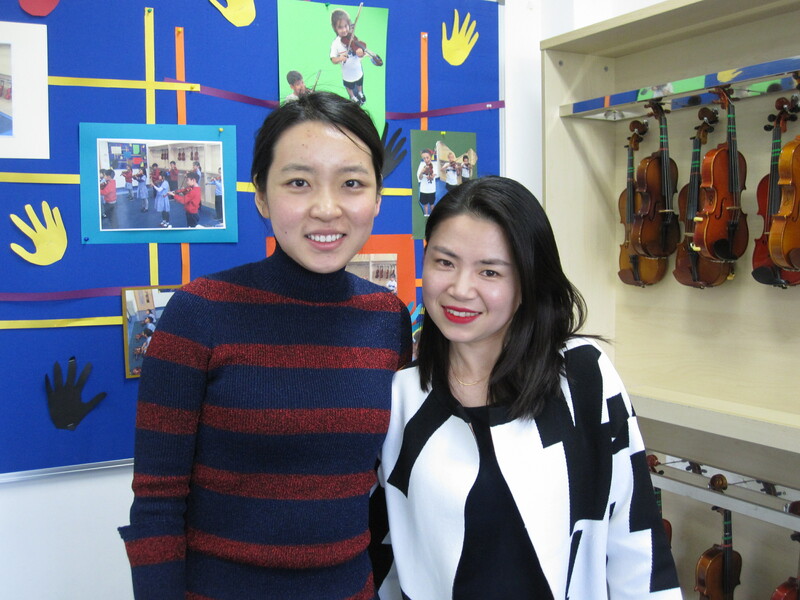 In order to gain a deeper understanding of the violin program at YCIS, we decided to interview both of our violin teachers Mira Yu and Sophie Zhang. 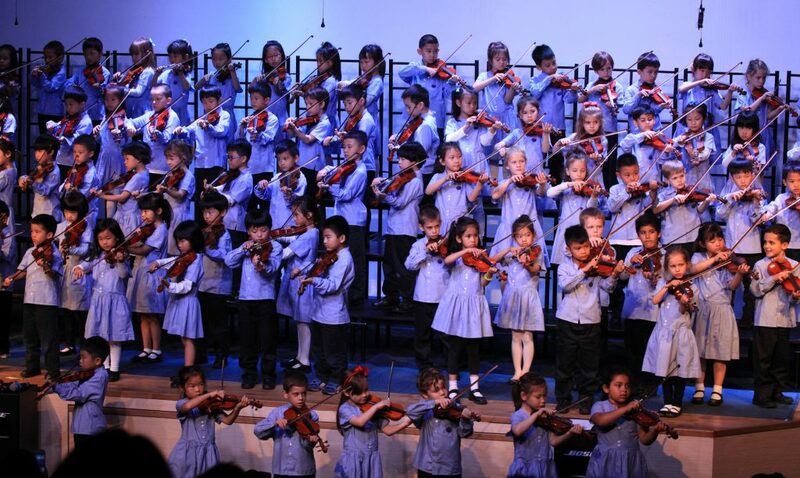 YCIS is very proud to have a violin program as part of the music education for the children. Could you tell us more about how this is structured? Which year levels benefit from this program and how often do the students have class? Sophie: Students start the violin program from K4 all the way until Year 3. There are three 30-minute lessons per week. In total, students have 2 lessons of violin taught by the Violin Teachers and one practice lesson. 90 minutes per week altogether. What do you think the violin program brings to the students? Mira: K4 children are growing up and their fine motor skills are still in the development stage. 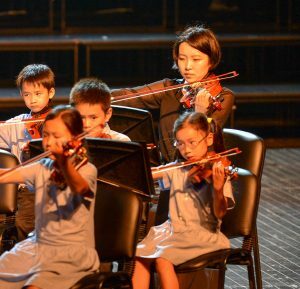 At this age, it is difficult to control their fingers when starting to play the violin. However, after several months, they are able to put their fingers on the right string and with constant practice, they are able to improve their focus and concentration. 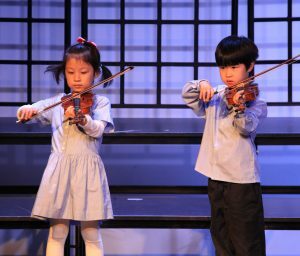 Sophie: Learning to play the violin can help the child have a balance between being active and being calm and focused. 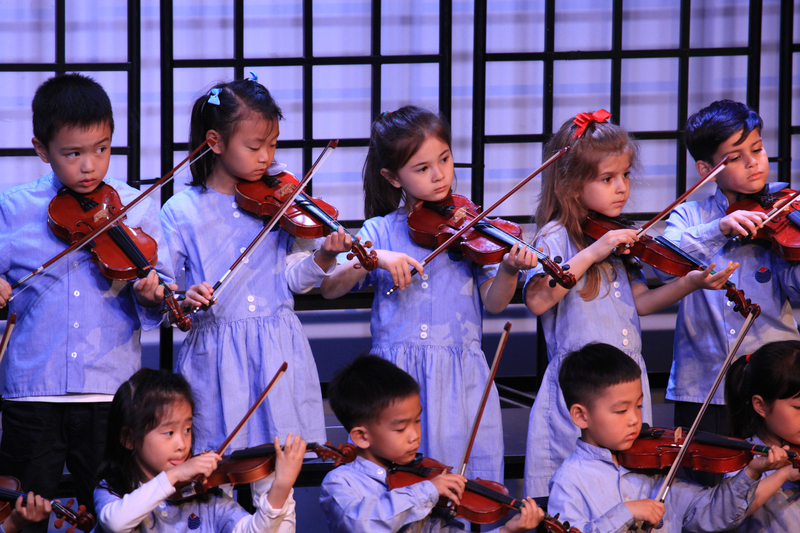 With the violin, children need to develop their listening skills to get the appropriate sound. Attention and focus are essential to be successful. Otherwise, you cannot understand how to play properly. 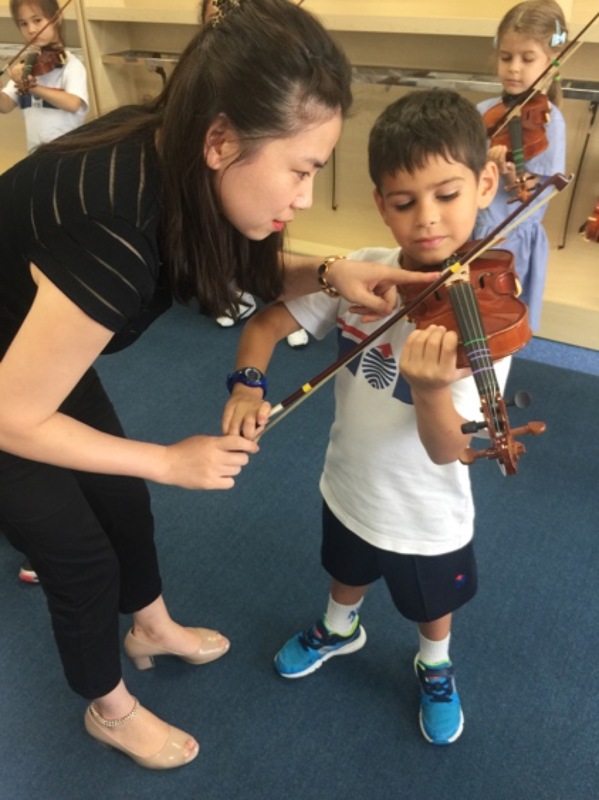 Mira: When children learn to play the violin, we have some accompanying music. This helps children to pay attention, to recognize when exactly they are supposed to start playing. 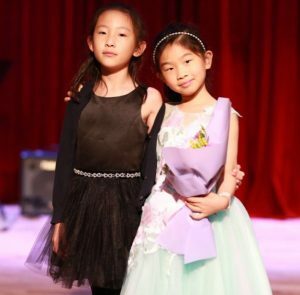 Sophie: Finally, since they are playing in a group, they learn to follow the speed and work with others. 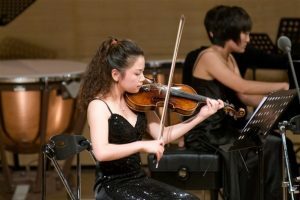 Could you quickly tell me about your background and also why you chose to make violin your career? Mira: I have a Masters Degree in Violin Performance and while studying, I supported my teachers as a teacher assistant and taught some students at the university for two years. 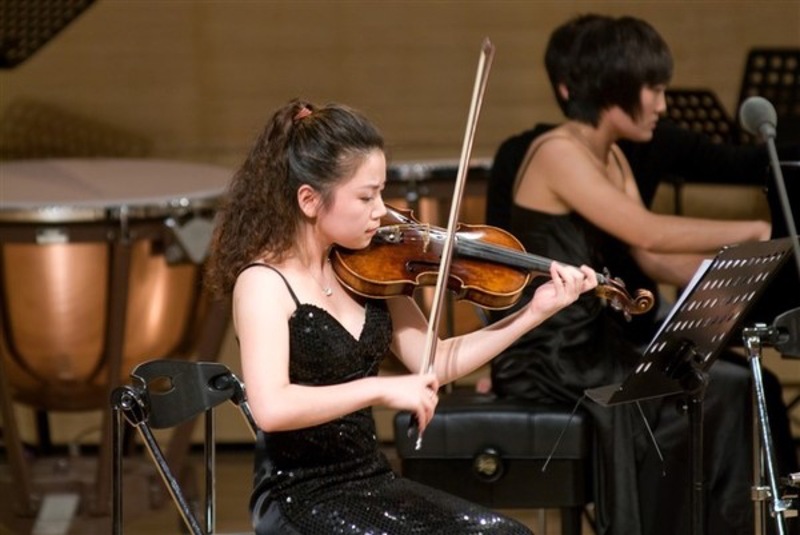 I used to play in chamber music and orchestras in Shanghai. 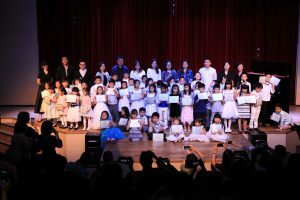 I started at YCIS teaching in Century Park campus and then became a Violin teacher in the Primary section here at Regency Park Campus. I realized that I developed an interest in violin during study, and was especially motivated by teachers who saw my performance. Music makes my life different and extraordinary. 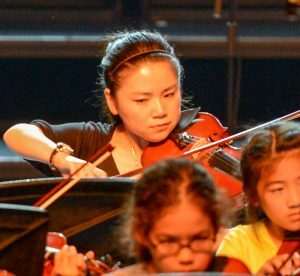 Otherwise, as a violin teacher, not only am I able to share my skill and knowledge to students, I am also learning the art of teaching. This profession has given me so much happiness. 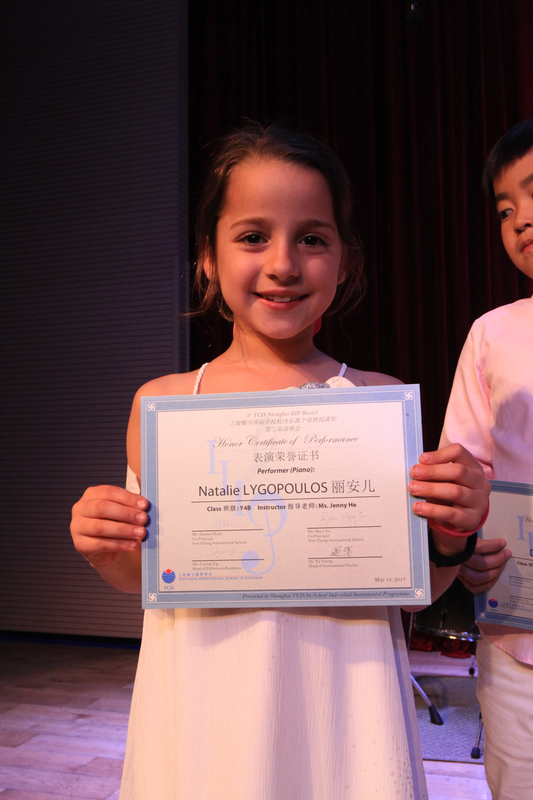 Sophie: I have a diploma from Shanghai Normal University in Violin. Before coming to teach at YCIS, I taught for 2 years at Qingpu Theatre school for choir and orchestra to 7-9 year old children, then I taught in a specialized violin school. Since you, Mira have been teaching here for 3 years and you, Sophie for 6 years at Regency Park Campus, can you tell us how you have seen the students progressing? 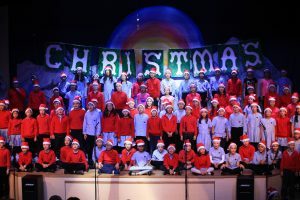 Sophie: It depends a lot on each student’s learning ability and the skills that develop differently for every age-level. Mira: There are different types of children. Some just practice at school, others also practice at home and others take extra lessons to support their learning at school. 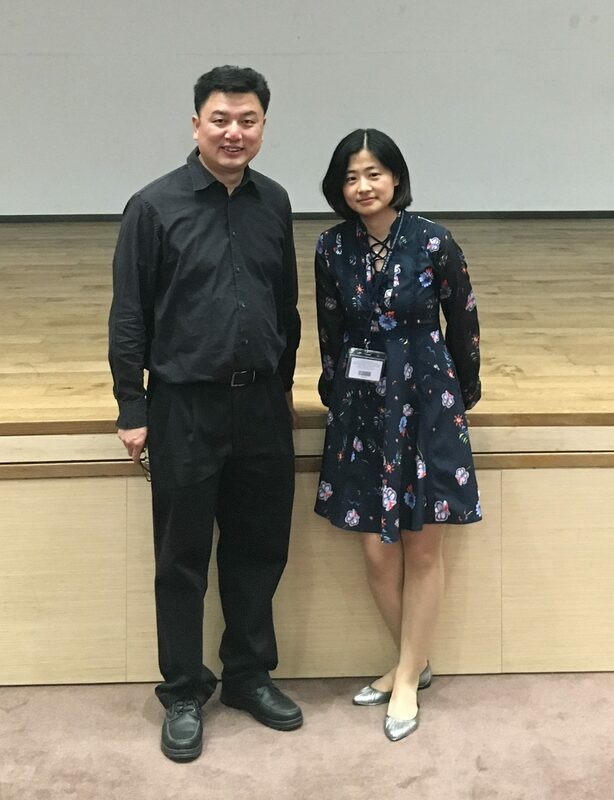 Sophie: What is nice is that there are many students who are joining the Violin ASA or the orchestra, and there are very talented students who take part in the advanced violin ensemble. 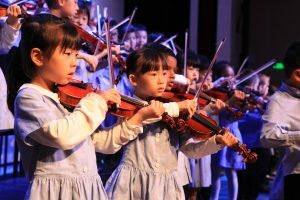 It shows us that they are very interested in playing violin and are enjoying it. What type of opportunities are there for the students at YCIS to extend their interest in violin? 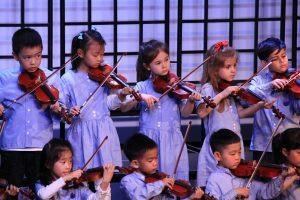 Sophie: We offer a violin ASA for Year 2-3 who usually are joining for 2 years, where they develop their skills and play pop songs. Mira: There is also the orchestra that Year 4 to Year 6 students can join after an audition. The students get to play at different events such as Christmas Tree Lighting and major concerts. Mira: We have the end-of-year violin concerts, which give an opportunity for all the students to perform and show how much they have been able to learn across the year. 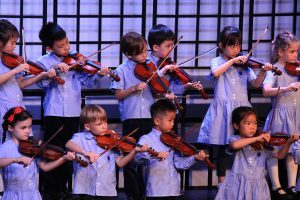 Year 1 Violin Concert is about a one hour performance and the students are playing 12 different pieces: modern, classical… whereas Year 2&3 Violin Concert is more focused on one theme. This year, the theme is “Stars Wars”! 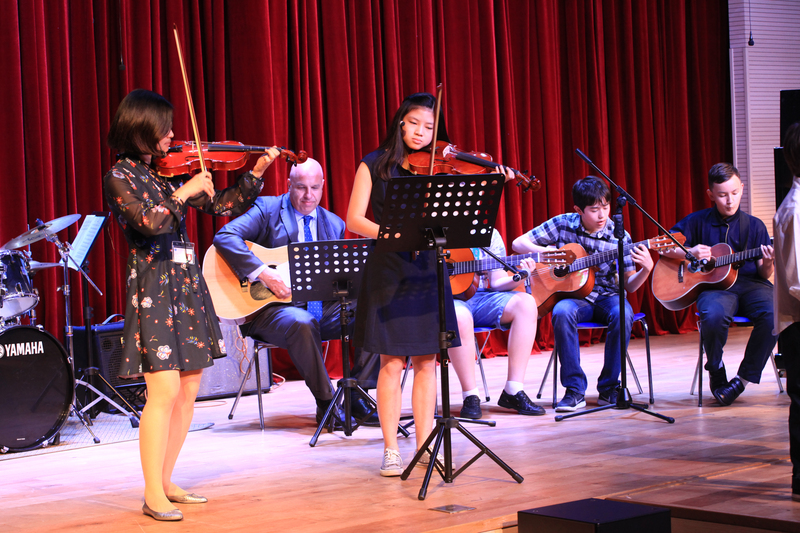 Sophie: Recently, 15 students of our Advanced Violin Ensemble played a 2 minute New Soul play at the international EAL conference hosted by YCIS at Regency Park Campus. 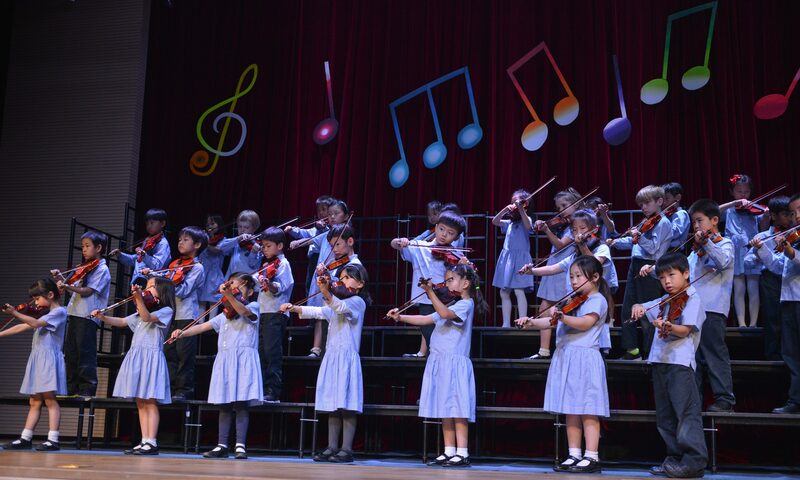 Mira: You also have the big annual Seeds of Hope Concert, which gathers all the best violin players of YCIS schools from China, Hong-Kong and Silicon Valley, where some of our students took part again this year! What do you enjoy the most when teaching our students? 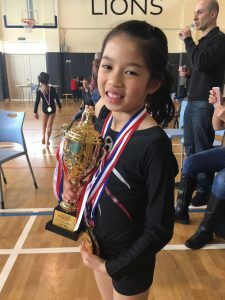 Sophie: For me, I like to find out different activities and exercises to attract the attention and interest of the students. 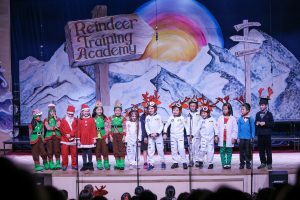 YCIS students learn in a joyful way in other subjects, so I need to develop my creativity to meet their basic expectations. 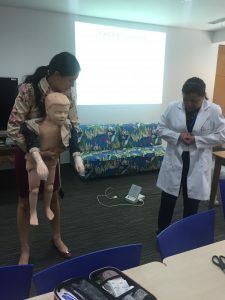 Mira: As for me, since students come from diverse cultures and families, I find it very interesting to try to understand the psychology of the student in order to be able to motivate him/her. 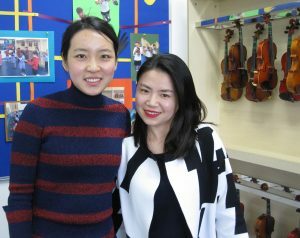 Many thanks for your time and we are eager to see the Year 2/3 Violin Concert beginning of June!